It’s that time again! Get ready to gather your family and friends, to spread some serious SMILES all over! Doing GOOD is an idea that many of us hold deeply within us. We all want to go out and spread some happiness – but sometimes just can’t seem to find the time. That’s why for the last five years, my family and I have started a GOODness Campaign called ’30 Days of Ramadan GOODness’. During the month of Ramadan we intentionally set out to achieve one GOOD deed every single day, some big and some small – donate some money, lend a helping hand, help the environment, or even just a smile – we have found that there are so many ways to spread GOODness all around us…and the feeling is contagious. Soon you’ll find that the people around you will also start to spread GOODness of their own. Performing GOOD deeds not only makes an impact on the people that are on the receiving end, but we too are changed and grow with every GOOD deed we complete. Take the challenge with us this year and spread ’30 Days of Ramadan GOODness’ throughout your family, friends and community…are you up for the challenge? We have found that by sharing our deeds, we were able to encourage other families from all over to take part in spreading some GOODness, which made the impact even bigger. If you are interested in getting involved, check us out on Facebook and help make this world a better place, on deed at a time! I can’t believe that it has already been five years since my family and I started the #30DaysOfRamadanGOODness – along the way we have been blessed to meet so many inspiring and caring people. From little kids taking part in GOOD deeds, to engaged community members planning amazing events and all those on the receiving end…it has been such a wonderful experience. This year, as we turn five, we hope get even more people involved in delivering GOOD deeds, within their families, neighbourhoods and communities around the world. Join us as we set out to deliver 30 GOOD deeds in 30 days…are you up to the challenge? Day 1: Mason jars filled with yumminess! 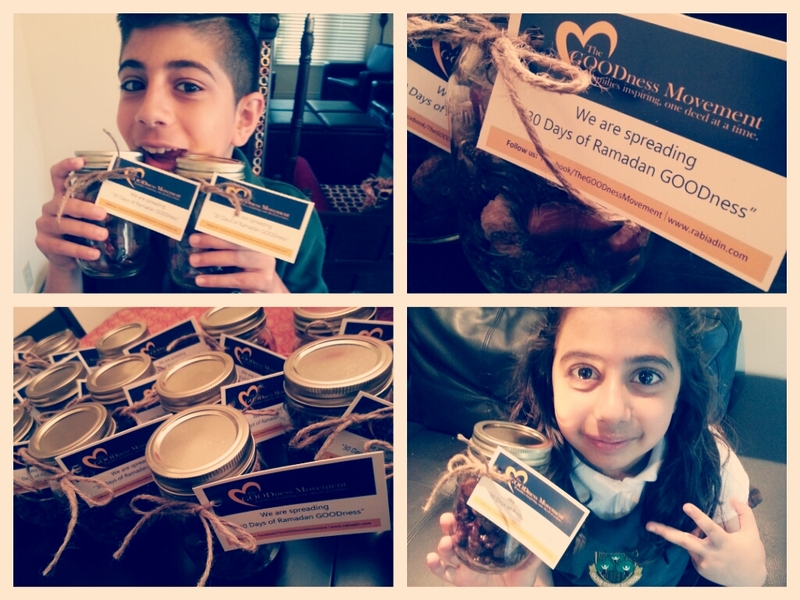 We started off our 5th year of Ramadan GOODness as we have in the past – mason jars filled with delicious dates for our friends, family and even random strangers on the street! 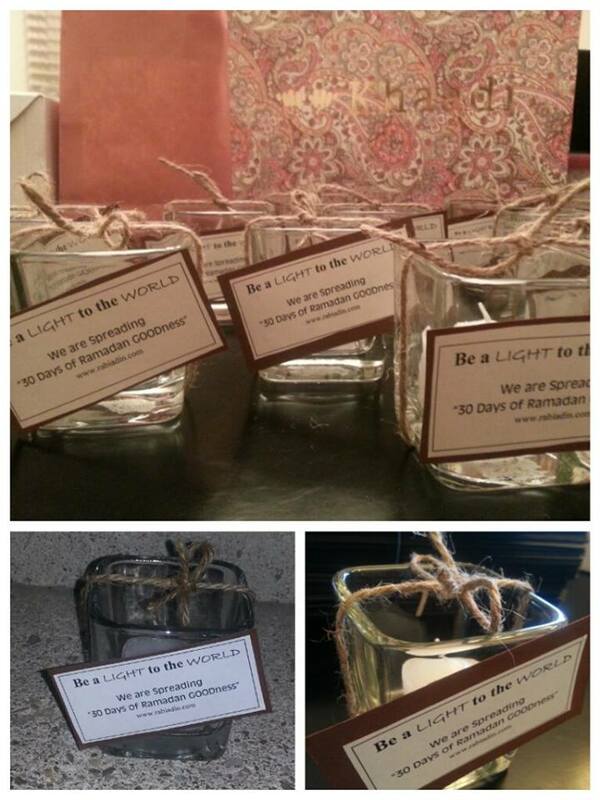 The kids worked hard on filling the jars and making them extra special for their first GOOD deed. Spreading some bottled yumminess all around! As everyone knows, Canada has done an amazing job welcoming the Syrian community into their new country. With so many generous people helping with the immediate needs – we asked the community how else we could help? Many of the kids shared that they really wish they still had their bikes – and of course, we saw that as an amazing opportunity to spread some GOOD! For Day 2, we are collecting gently used bikes and helmets to be delivered to some our friends in the Syrian community. If you would like to donate your bike – for any age group – please PM me! Spreading some GOODness and keeping fit at the same time! d 20% of Mississauga children live in poverty – that’s a very scary statistic about people living in our very own communities. So for Day 3 we decided to make a list of all the food items we thought the food bank could benefit from, picked them up from our local grocery store and dropped them off at a Mississauga Food Bank location – spreading some serious GOODness to the less fortunate living in our own community! r Somalia campaign through Islamic Relief Canada. We were able to purchase boxes of yummy cupcakes and have them delivered to friends, family and even some for the homeless. The money raised will be used for development projects in Somalia – TWO GOOD Deeds in one! Spreading some much needed GOODness in Somalia, while sending some yummy treats to those in our own community! Check out the link below and support his amazing initiative! Tasbihs (Prayer beads) have always been very important us. We all have our favourite ones and many carry them with us at all times. For today’s GOOD deed we decided to distribute beautiful wooden Tasbihs to the people all around us. We will also be distributing them at an iftar dinner and mosque later tonight, Spreading some spiritual GOODness to the heart and the soul! ecessities to be dropped off an a temporary shelter location. Hoping to spread a little GOODness to those that need it the most! usually end up thinking about ourselves last. For today’s GOOD deed the kids decided to surprise an amazing mamma of 3 with a day of babysitting! We will go over and watch her kids while she gets herself pampered – spreading some self care GOODness to a hard working mamma! Water statistics are truly shocking: nearly 800 million people have no access to clean water, while a woman in Africa walks an average of 6km a day to fetch clean water. For today’s GOOD deed the kids decided to research one of the places that water was needed the most, and made a donation towards building a water well. Spreading some GOODness through the gift of water. Day 10: Gratefulness Jars with some amazing kids! We can’t believe that its already the 10th day of GOODness, the days seem to be flying by! For today’s GOOD deed we took over an amazing Grade 3 class at Olive Grove School. Each student was able to create their own unique ‘Gratefulness Jar’! The students will take the jars home and everyday will write down one thing that they are grateful for – and put it into the jar. This is also great for days when a student is feeling down – they can open up the jar and remember all the things that they have to be grateful for! Spreading some GOODness with an inspirational group of kids! 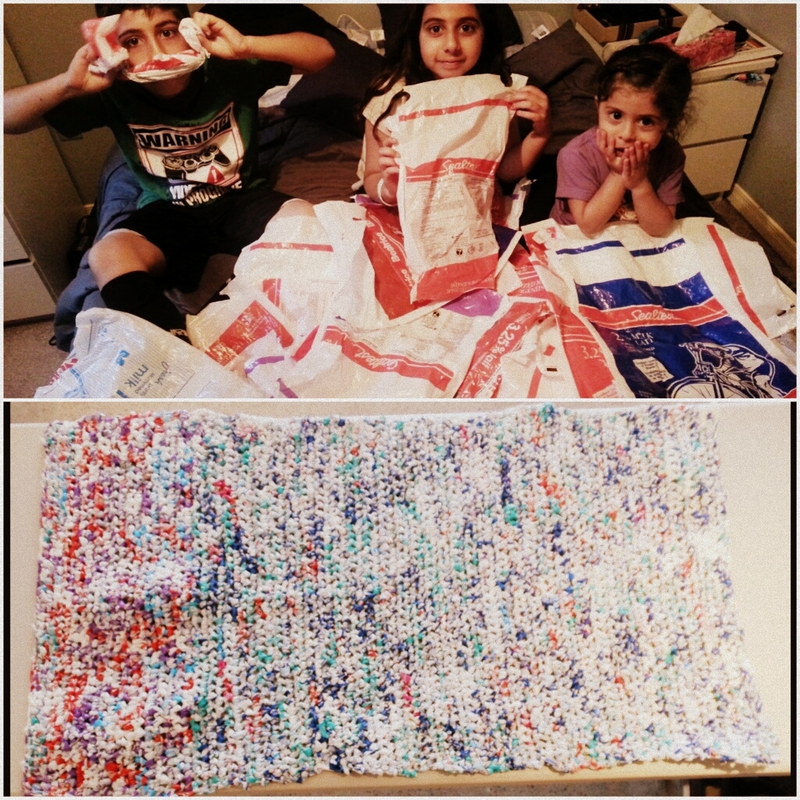 Today we decided to support an innovative idea that is making a huge difference in countries all over the world – Its called ‘MILK BAGS Unlimited’ – and they collect used milk bags and weave them into adult size mats! The milk bag mats offer people without beds, a durable and washable alternative to sleeping on the cold and damp ground. Not only can these milk-bag mats provide comfort as a bedding alternative, but have been used by health-care professionals as a substitute for an operating table where resources are scarce…HOW AMAZING, right? Collecting Milk bags and spreading some international GOODness! Today’s GOODness was a very special experience. 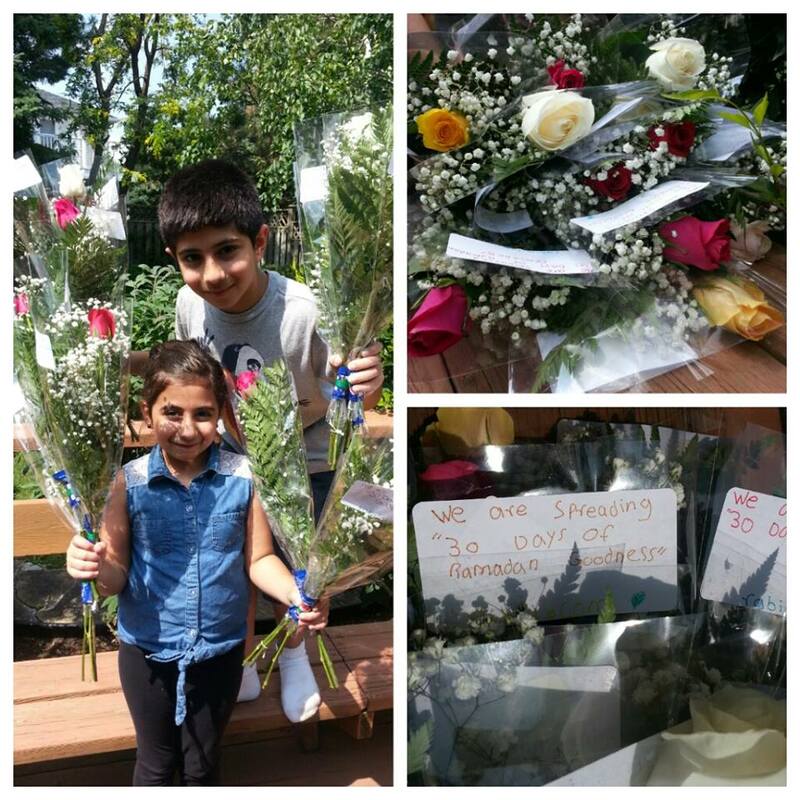 We grabbed the family, arms full of flowers and filled with duas – we head out to the Meadowvale Cemetery. It was such a humbling experience, remembering all of our family members that were taken to soon and honouring those in the cemetery that we never had an opportunity to meet. Spreading some GOODness, in the most humbling way possible. Today we decided to support an initiative very close to our hearts started by Imran Chaudhary – 100% of all donations collected go directly to providing staple food items, such as rice, flour and cooking oil, for people in inner-city Lahore (Pakistan). The money raised will go towards providing meals for 20 families a month! If you are interested in donating to this amazing cause, one that gets directly to the people, please message me and I will get you the details…spreading some serious GOODness to those that need it the most! My family and I, like most families living around us, spend a lot of our time driving – especially on the highways. On many of our usual exits, we often see one or two people standing on the corner of the off ramp holding a sign and asking for change. For today’s GOODness we will drive around the highways, exiting at different ramps and surprising some of these people with a nutritious lunch and Tim Hortons gift cards to eat something a little later. Spreading some nutritious GOODness on off ramps across the city! For today’s GOOD deed we decided to spread some GOOD to beautiful Peru! We spent the morning with a great group of Grade 5 students at Olive Grove School and asked them to write letters to another grade 5 class in a small rural area of Peru. The kids had a great time imagining what life in rural Peru would be like and then describing themselves and their communities – in creative letters (nothing beats a hand written letter). The letters will be taken to the school in Peru by a friend of ours and fingers crossed that the kids will get letters in return! Spreading some GOODness to the kids in Peru – the old fashioned way! For today’s GOOD deed we decided to support March of Dimes and their Pop Can Tab Collection Program. Tabs that we have collected, will be recycled and used to generate revenue that will benefit their Assistive Devices Program that helps buy, repair and maintain a wide variety of mobility or assistive equipment (including wheelchairs) – this is a year round initiative for March Of Dimes and is most effective when collected in large quantities – so start collecting today and spread some GOODness by recycling and helping others at the same time! For today, we did one of our all time favourite GOOD deeds, one that we often do throughout the year. We went through the drive thru line at Tim Hortons and payed for the cars behind us – spreading some surprise GOODness to unsuspecting drive thru customers at our favourite joint! Day 19: Clothes, Clothes and more Clothes! Like many families, our family often buys too many clothes – some even sit in the closet with tags on them for years. For today’s GOOD deed we decided to grab all that extra clothing and donate it to ‘Haven On the Queensway’ – an amazing charity collecting clothing for those in need. We were able to gather so many great items! Special thanks to Serena Paul for dropping off 6 big bags to add to our donation! Today’s GOOD deed was very tiring, but a rewarding adventure. We participated in an amazing international initiative called Fasting 5K – where people in various different cities take part in a 5km marathon while fasting. We all took part and had a blast! All proceeds from money raised will go towards Nexus – an agency working towards better mental health for youth! We made it and had a blast doing it! Today’s GOOD deed was another fun yet tiring one! Today we teamed up with the amazing Muslim Moms in Durham Region and head out in the beautiful sunshine to clean up the Ajax Rotary Park. We had a great time and finished off the hot afternoon with lots of bags filled with garbage. Thanks so much to Anisa, Kubra and Amber for an amazing collaboration, and to all the Durham moms (and kiddies) that participated! Spreading some GREEN GOODness in a community park! creation Centre (MYRec Centre) was organizing. They were able to collect hundreds of toys for a variety of different causes, and donated over 60 amazing toys to The GOODness Movement for our collection! Spreading some serious GOODness and big smiles to kids that really need it! and every Ramadan chose an initiative that they would like to donate to. For this year they decided to support a community agency doing some amazing work in Chicago. 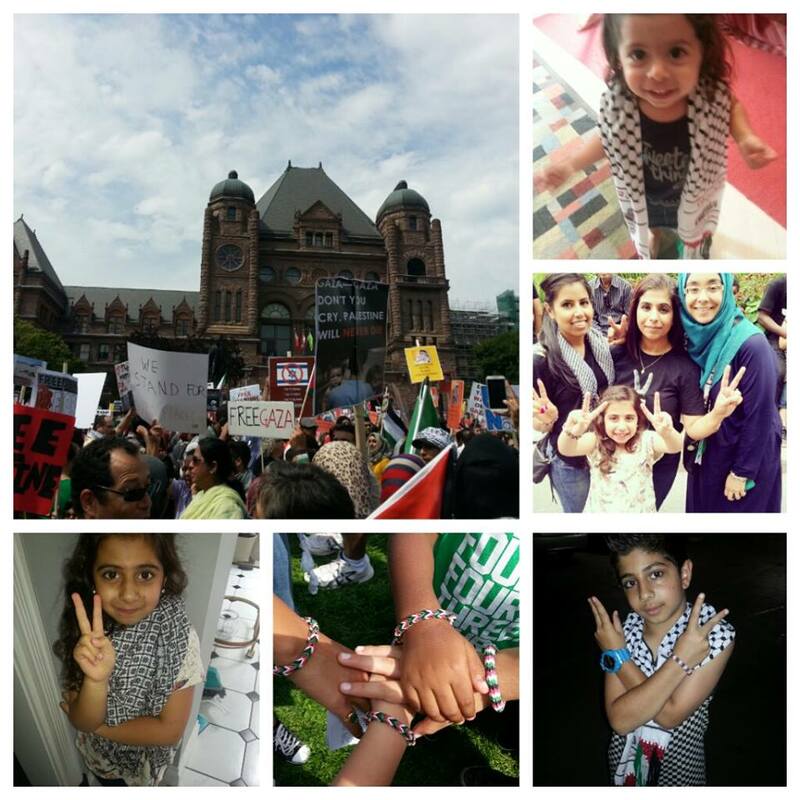 For the last five years, The HEART Women & Girls Project has been working hard to promote health education and violence awareness in Muslim communities in a way that is free of blame and shame, empowering, and honours the faith and cultural values of Survivors. Check out their page and the amazing work that they do! Today’s GOOD deed was yet another fun filled experience! Today we decided to spend our evening volunteering with SEVA Food Bank – a local initiative that is doing so much great work to end hunger in Mississauga! We were able to sort, shelve and ration various food items. The staff was so welcoming and the entire experience quite humbling – we even got to graffiti the wall with our signatures! Spreading some GOODness while doing our little part in fighting hunger! For todays GOOD deed we decided to spread some love and support children, and their families, living with disabilities and/or critical illnesses. SMILE Canada is an inspirational non profit that is mandated to develop community based awareness of the limitations faced by children with disabilities and critical illness. For today’s GOOD deed, a bunch of our GOODness peeps put together money to purchase gift cards for all the children attending the SMILE Eid celebration next week! 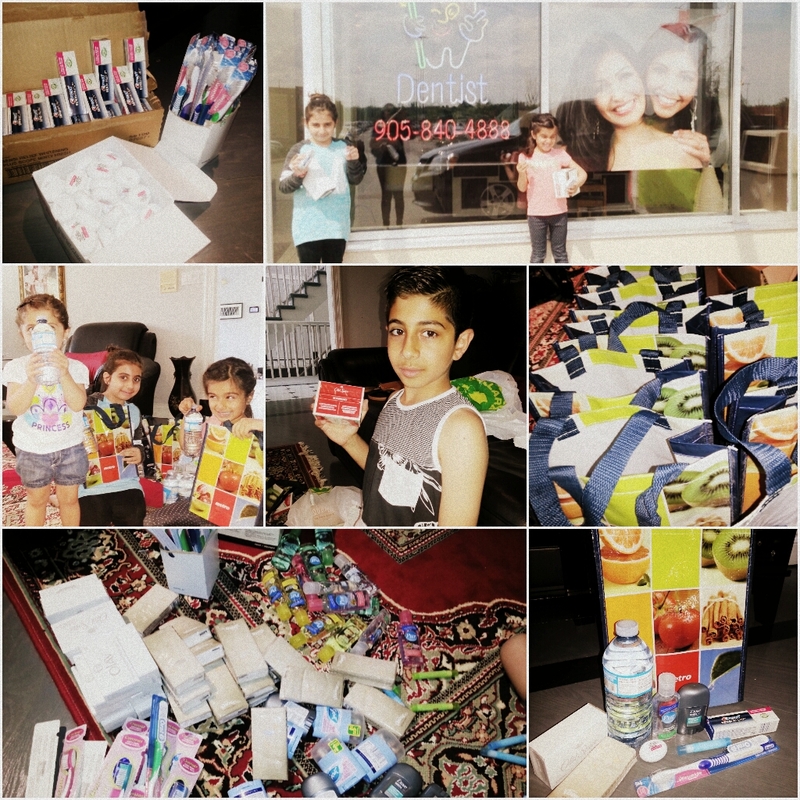 Spreading some smiles with SMILE Canada! Day 26: Candies, chocolates and treats…oh my! For today’s GOOD deed, one of the smallest members of our GOODness family head out into the streets to distribute yummy GOODies to friends and neighbours. People were all laughs and grateful for the surprise! Creating smiles and friends, one GOOD deed at a time! Day 27: Some GOODness for our feathered friends! Dness to our animal friends, while beautifying our community! This is a really fun and easy way to do a GOOD deed with your family – so if your looking for something to do in the beautiful weather this weekend…this is it! Spread some GOOD! We live in a world faced with catastrophic issues, such as extreme poverty, disease, starvation, human trafficking, and the exploitation of child soldiers. At the core of those issues is one common link—the Orphan. Currently, there are over 150 million orphans in the world . . . abandoned, neglected, and vulnerable. 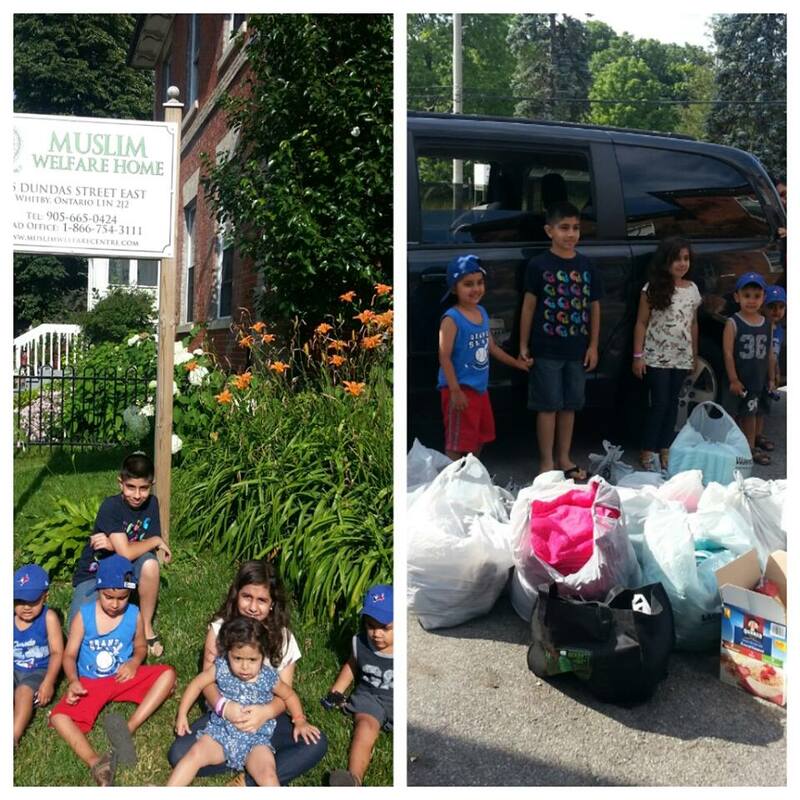 For todays GOOD deed the kids decided to sponsor a group of orphans through Children of Hope. Hoping to spread some GOODness and love to little hearts in need! How many times have you gone to the grocery store to grab some stuff and realize that you don’t have a quarter for the shopping cart?! And end up having to balance arms full of groceries, because really, who carries quarters these days? That happens to us all the time! So for today’s GOOD deed, we decided to take over the entire shopping cart tent – pre-filling each cart with a quarter for the next shopper! Spreading some GOODNESS to stranded shoppers! My family, like many others, has a fear of public washrooms. Half because, well ew, and the other half just because public washrooms are so sad looking. For today’s GOOD deed we went all super spy and LOVE BOMBED a Walmart Washroom. We snuck in with our motivational decor, candles and scented soaps – we were super speedy spy mode…almost got busted, but had a great time! Spreading some love in the most unexpected places! Before you read all about our 30 Days of Ramadan GOODness 2015 – Take a look at our video with highlights from each day! Doing GOOD is an idea that many of us hold deeply within us. We all want to go out and spread some happiness – but sometimes just can’t seem to find the time. That’s why for the last four years, my family and I have started a GOODness Campaign called ’30 Days of Ramadan GOODness’. During the month of Ramadan we intentionally set out to achieve one GOOD deed every single day, some big and some small – donate some money, lend a helping hand, help the environment, or even just a smile – we have found that there are so many ways to spread GOODness all around us…and the feeling is contagious. Soon you’ll find that the people around you will also start to spread GOODness of their own. Performing GOOD deeds not only makes an impact on the people that are on the receiving end, but we too are changed and grow with every GOOD deed we complete. Take the challenge with us this year and spread ’30 Days of Ramadan GOODness’ throughout your family, friends and community…are you up for the challenge? We recently found that by sharing our deeds, we were able to encourage other families from all over to take part in spreading some GOODness, which made the impact even bigger. If you are interested in getting involved, check us out on Facebook and help make this world a better place, on deed at a time! Day 1: Date jar yumminess! Like previous years, we decided to start of our GOODness on a sweet note and decided to put together beautiful little mason jars filled with delicious dates and figs. The kids always enjoy this one – and this year were able to give some out in their school, to family, and to our surrounding community. Spreading some yummy GOODness…one jar at a time! Day 2: Grade two bird house FUN! Today’s GOODness was filled with creative little minds and big smiling faces! We went into my daughter’s grade 2 class and decorated beautiful little birdhouses. We talked about the importance of showing compassion to God’s tiniest creatures and beautifying our neighbourhoods at the same time. 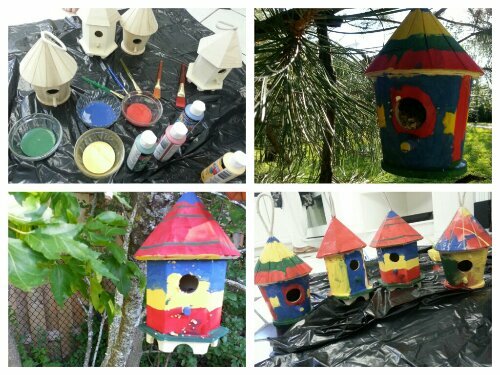 The kids came out with bright colourful birdhouses, and had an amazing time spreading some GOODness to our tiny little feathered friends! 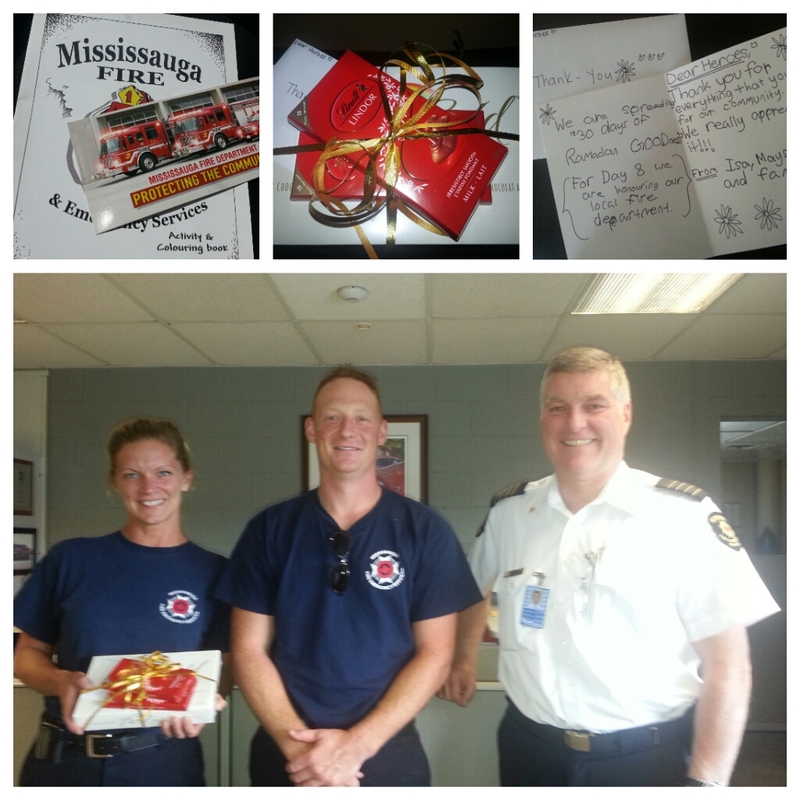 Today we decided to honour our brave firefighters and surprised the local Fire Department with Tim Hortons (obviously)! The kids had a blast…they were able to play with the sirens and try on uniforms! They even got to keep some awesome fire helmets and a cute little stuffed dalmation!! Spreading some GOODness to our community heros and haveing a blast while doing it! 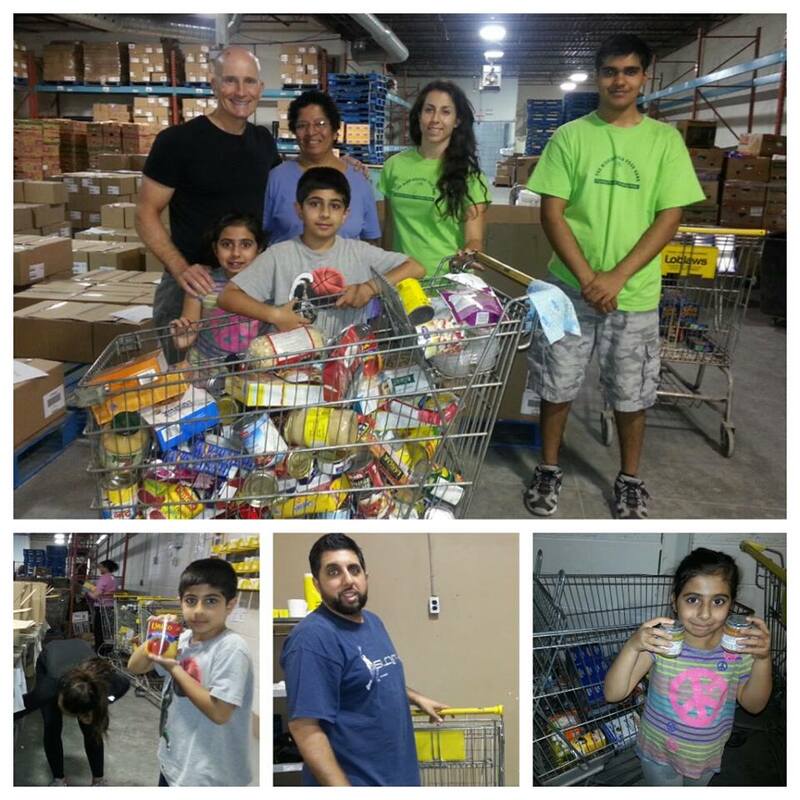 We often volunteer at The Mississauga Food bank to help sort food donations. Last week we called and they said that they didn’t need volunteers because food donations were at a low. So for Day 4 of GOODness we decided to help out by collecting non perishable food items for those in need. We drove around the city picking up the donations from family and friends and were able to gather so much…spreading some much needed GOODness to those in need! Our community mailman is really great – he works really hard and is rarely ever seen or appreciated. That’s why for Day 5 of Ramadan GOODness we decided to surprise him with a Gift Card and personal note. The kids put it all together and left it in our mail box for him to find in the morning….spreading some smiles one mail box at a time! We were moved by this article that we found in The Toronto Star. This couple needs help to purchase special baby formula for their newborn twins that their insurance won’t cover. We decided to surprise them with a case of formula in attempts to send some GOODness their way! If you would like to support this family, please PM us for more details! Today we decided to spread some GOODness cheer in our local laundromat! We quietly walked around the aisles filling up a bunch of empty machines with money. At first the employee thought we were crazy, but was so excited when we explained what we were doing…she said she was going to tell everybody who used the machines that they had to spread some GOODness of their own! 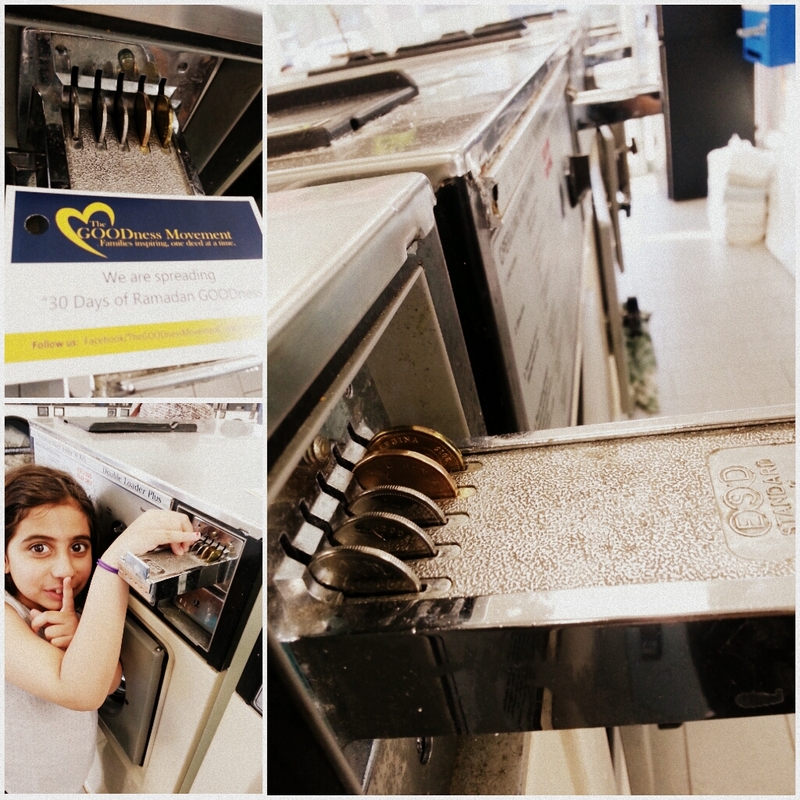 Spreading some Ramadan GOODness in the laundromat! Someone recently reached out for a friend of hers that had lost everything in a fire. She is a single mother of two, and really struggling with everything to get by. We asked the friend what things were needed urgently and she shared the need for all toiletry type items. We grabbed some stuff to help out a little, in hopes to spread some GOODness to a family in need. Day 10: Some dry GOODness on a rainy day! Today was a super wet, cold and rainy day- with lots of people caught outside unprepared for the weather. So for todays GOOD deed we decided to buy a bunch of umbrellas and leave them in a basket at a busy bus stop. That way people could jump of the bus and grab an umbrella to avoid getting wet…spreading some dry GOODness on a wet and rainy day! Today we decided to spread some inspirational GOODness at the local library. 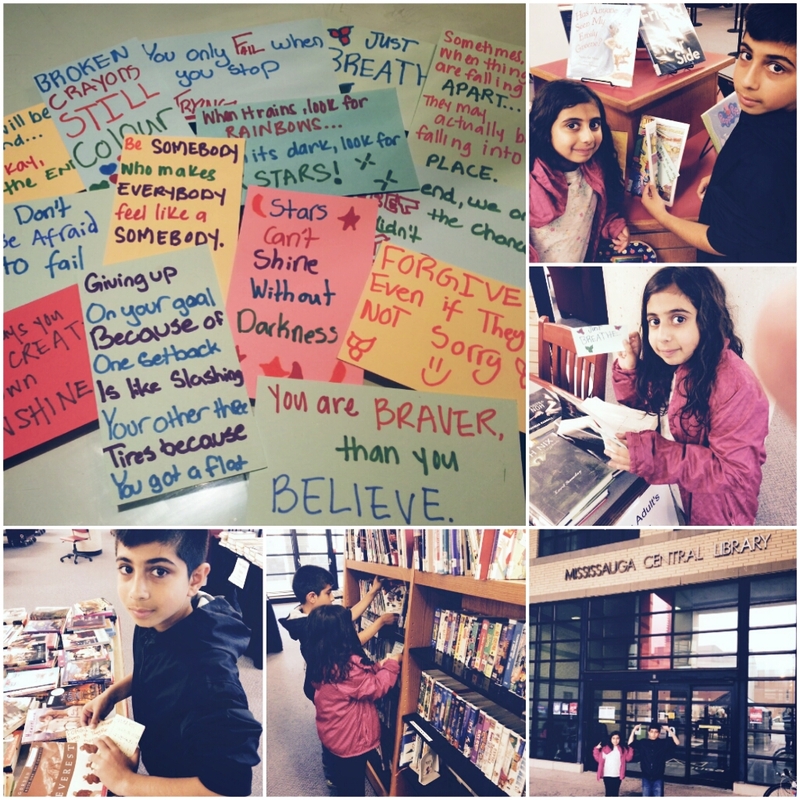 The kids put together inspirational quote cards and hid them in books all over the library – hoping to spread some smiles to unexpecting readers of all ages! Today we decided to spread some GOODness to the most needy in our community. We put together care packs for the homeless and gave them to a local shelter to distribute to those that needed them the most. The packages included many important toiletry items and water bottles. Thank you to Aysha Ali and Tazeen Khan for helping fund todays GOOD deed and our amazing community dentist, ‘Heartlake Dentistry’, who donated a huge supply of toothpaste, brushes and floss for all the care packages. Spreading some much needed GOODness…to our community’s most vulnerable! 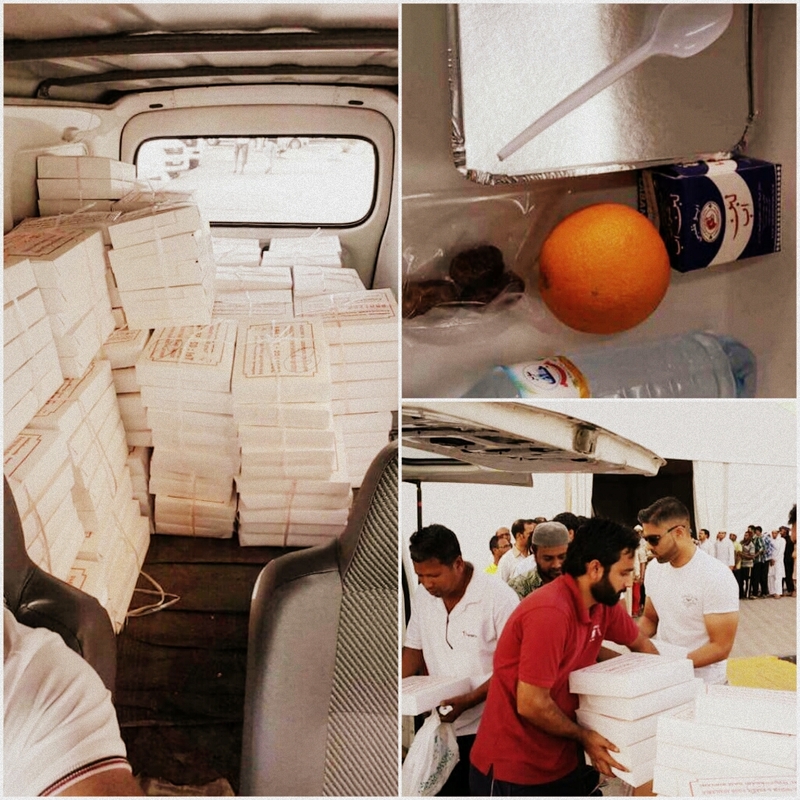 Some friends from Abu Dhabi recently connected with us about an opportunity to provide Iftar meals for hard working labourers that need a lot of support. 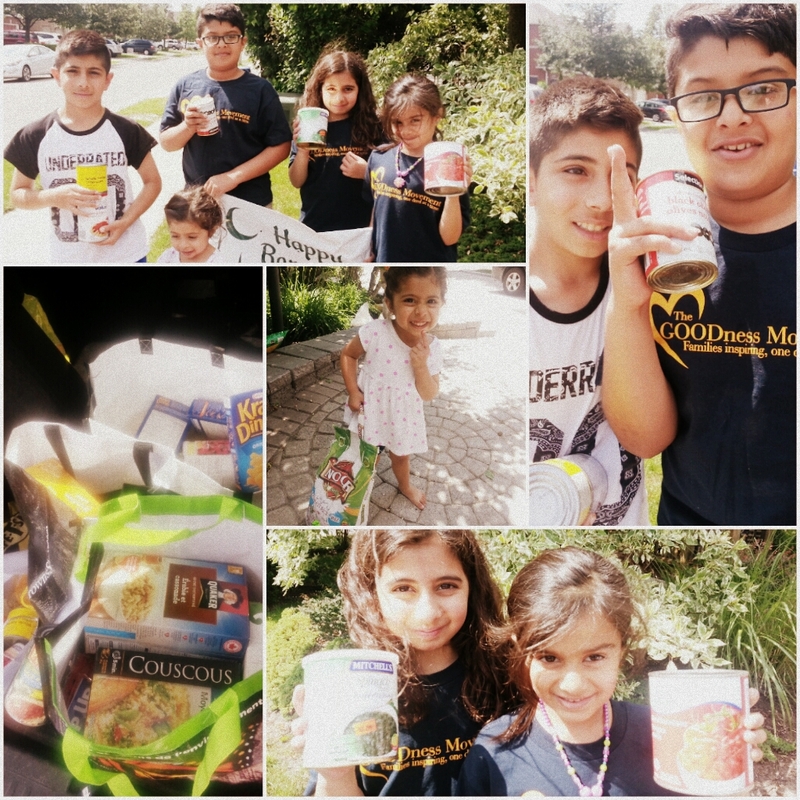 These friends had already been providing such meals throughout Ramadan and it was our pleasure to be able to help! Supporting The GOODness Movement overseas and spreading some GOODness to those in need! In honour of Canada Day we spent the day driving around rural backroads and countrysides – soaking up some Canadian beauty! For today’s GOOD deed we decided to stop off at one of the gas stations in this area and secretly pay for someones gas standing behind us…I’m sure he must have been thrilled, who doesn’t want some free gas?!? Spreading some Ramadan GOODness in rural town Canada! Its half way through through the month of Ramadan and we have been really busy! Today we decided to pull together some of our GOODness army and hit the streets to do a community clean up! It was hot and long but the kids had a blast – even the smallest little members of the GOODness army took part! Spreading some GOODness and cleaning up our community at the same time! This is said to be one of the hottest summers on record around the world – and many people are suffering without any any access to clean drinking water. For today’s GOODness the kids spent some time on the web researching different options to give the gift of WATER. They decided on funding a WATER WELL in a village in Pakistan! This way people would have access to clean water all year round! We used IDRF (International Development and Relief Foundation) as our charity – A very special thanks to Aysha Ali and Shamim Khan for funding the well with us! Spreading some GOODness through the basic necessity of water! Today was our annual Toy Drive for The Sick Kids Hospital, an initiative started by Huma Khawja – all donated toys will go into a ‘Treasure Box’ at the Hospital and every time a child has a surgical procedure they get to choose a gift from the Treasure Box! This year we were extremely fortunate to be able to team up with a Toy Drive that the Muslim Youth Recreation Centre (MYRec Centre) was organizing. They were able to collect hundreds of toys for a variety of different causes, and donated over 150 amazing toys to The GOODness Movement for our collection! 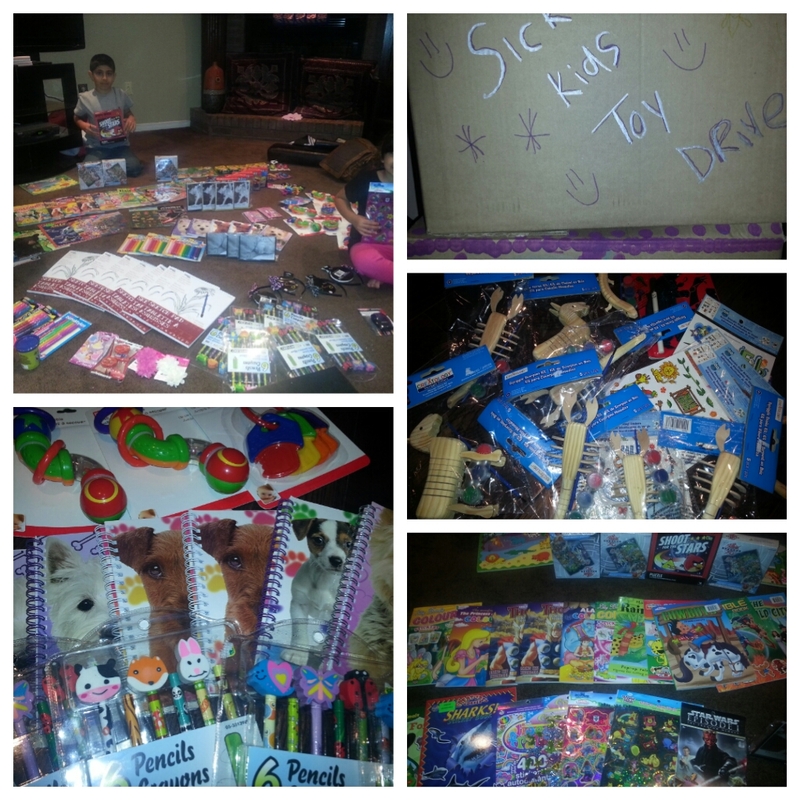 Spreading some serious GOODness and big smiles to kids that really need it! For today’s GOOD deed we had the opportunity to volunteer with an amazing initiative called ‘ Ramadan Sammich ‘ – every Sunday during Ramadan a big group of volunteers get together and assemble hundreds of sandwiches/lunch bags to be distributed in shelters across the city. The kids we on bag assembly duty, putting together the contents of the lunch bags – they had a great time! What an amazing experience – spreading some GOODness and volunteering with a great grass roots initiative! 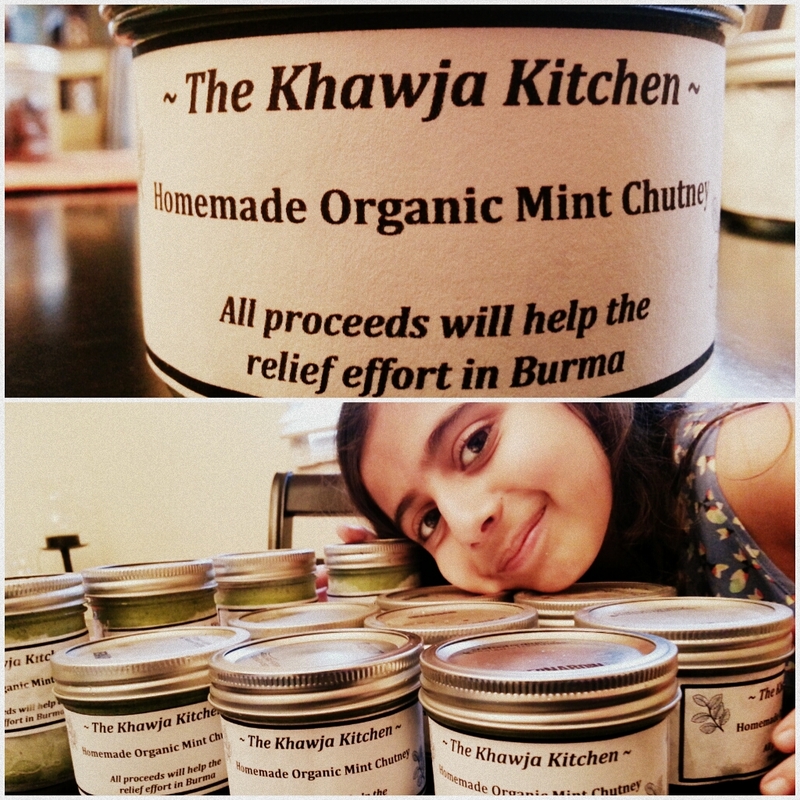 GrandPa Khawja is really well known for his amazing (and secret) Mint Chutney recipe…for today’s GOOD deed we decided to bottle up this spicy yumminess for a good cause! We will be selling each bottle for $5 and all proceeds will go towards helping the relief efforts in Burma – a cause chosen by the kids! Please let me know if you are interested in purchasing a bottle and supporting a great cause! Someone very close to us recently lost her husband – today would have been their 42 year wedding anniversary. To honour them and maybe add a little bit of GOODness into her life, we surprised her with a beautiful plant picked by the kids…in hopes that it would bring some peace during this difficult time! 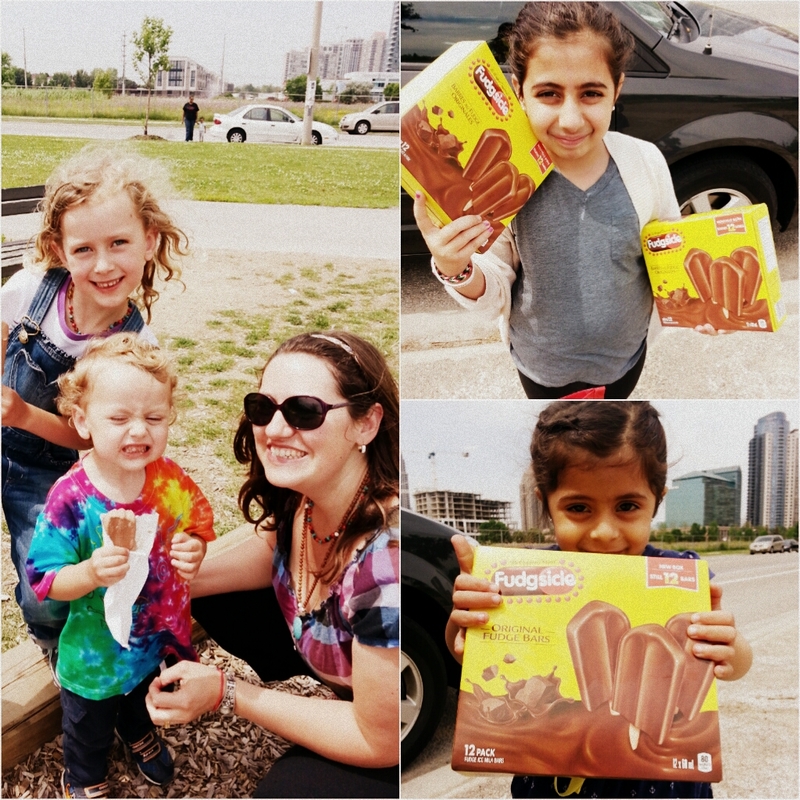 Today we decided to spread some summer cheer at the local park – we picked up a few boxes of yummy popsicles and gave them out to all the kids running wild in the sun! The kids loved them…and the moms loved them even more! 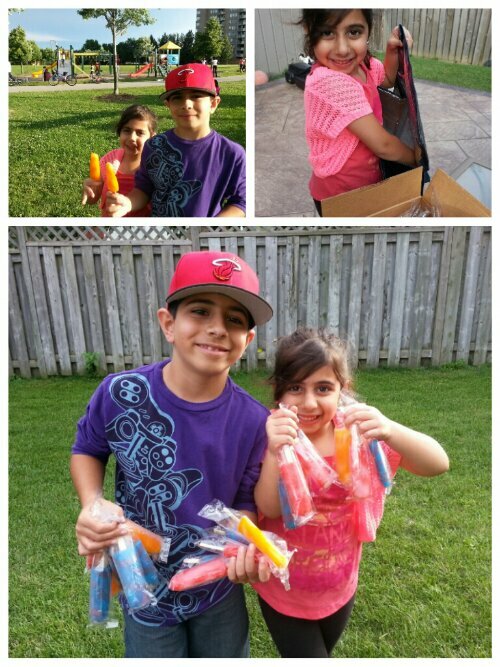 Spreading some yummy summer GOODness to the kids in our neighbourhood! 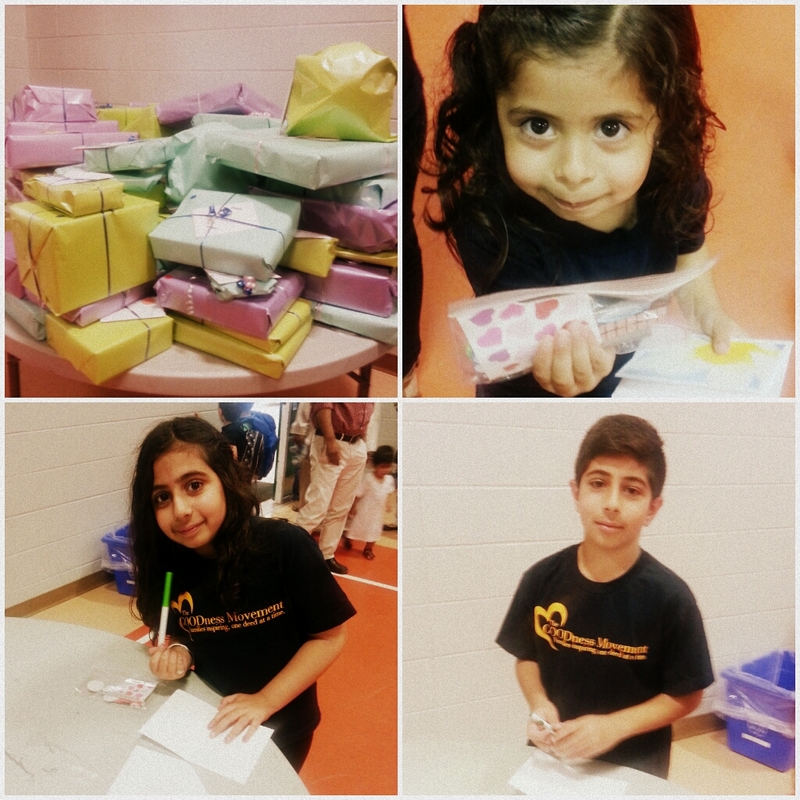 For today’s GOODness we participated in a local Eid Toy Drive held at Olive Grove School – each kid brought in a new toy and was taken through different stations to wrap the gifts and create personalized cards! All toys will be given to the Muslim Welfare Centre and will be distributed to children in need…spreading some GOODness one toy at a time!! Sports play a very important role for youth- it helps them develop strong relationships, is great for physical activity and keeps them out of trouble! 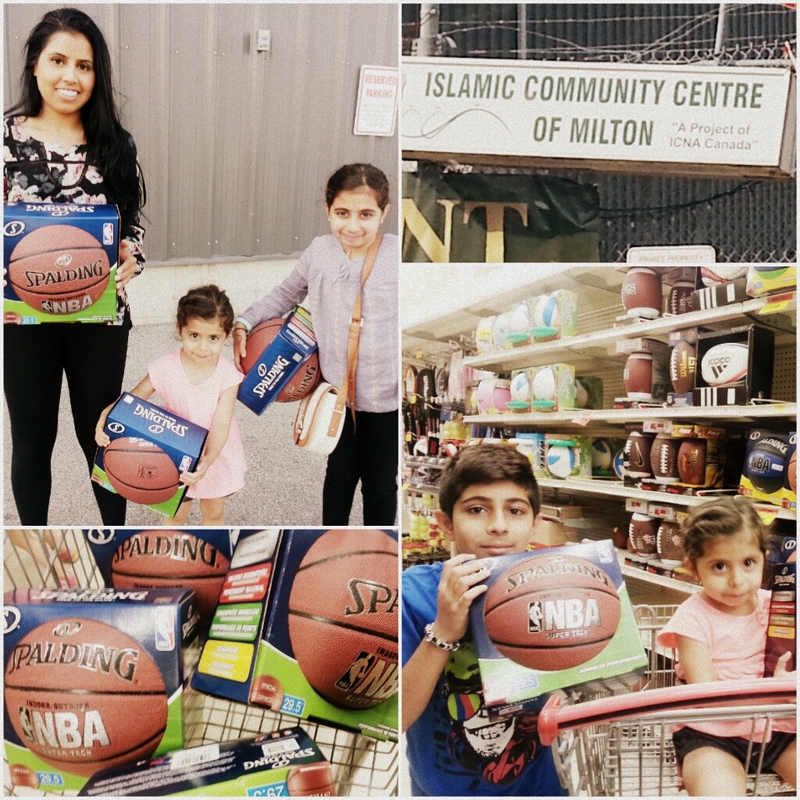 For todays GOOD deed we decided to surprise the Islamic Community Centre of Milton with some basketballs for their basketball courts – they have had the courts for a while but were lacking the additional equipment. Spreading some GOODness and giving youth an opportunity to build bonds! Doing GOOD is an idea that many of us hold deeply within us. We all want to go out and spread some happiness – but sometimes just can’t seem to find the time. That’s why for the last couple of years, my family and I have started a GOODness Campaign called ’30 Days of Ramadan GOODness’. During the month of Ramadan we intentionally set out to achieve one GOOD deed every single day, some big and some small – donate some money, lend a helping hand, help the environment, or even just a smile – we have found that there are so many ways to spread GOODness all around us…and the feeling is contagious. Soon you’ll find that the people around you will also start to spread GOODness of their own. Performing GOOD deeds not only makes an impact on the people that are on the receiving end, but we too are changed and grow with every GOOD deed we complete. Take the challenge with us this year and spread ’30 Days of Ramadan GOODness’ throughout your family, friends and community…are you up for the challenge? Day 1: Dates, nuts and love…oh my! For the first day of Ramadan GOODness we decided to put together beautiful little mason jars packed with nut filled dates. The kids had a great time putting the jars together and were thrilled with the idea of people thinking about them while opening their fast in the evening. 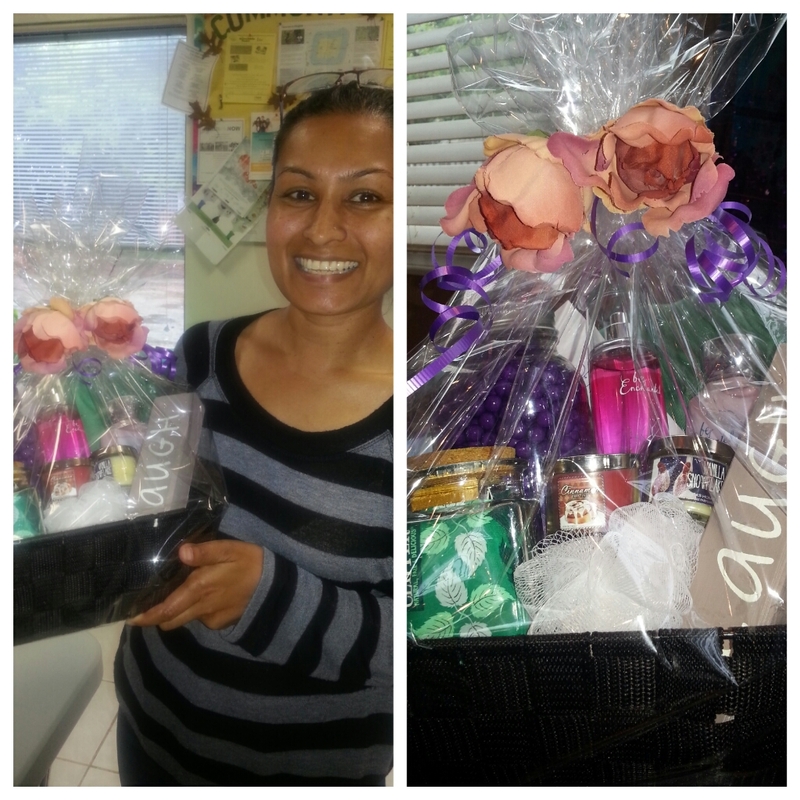 We distributed the jars to family, friends and even some neighbours…spreading some yummy GOODness one jar at a time! Have you ever gotten to the grocery store and realized that you don’t have a quarter for the shopping cart? I have, many, many times. And then I am left with two options, either the kids and I end up balancing groceries on our arms up and down the aisles, or we have to walk around trying to get change…both end up being equally embarrassing. 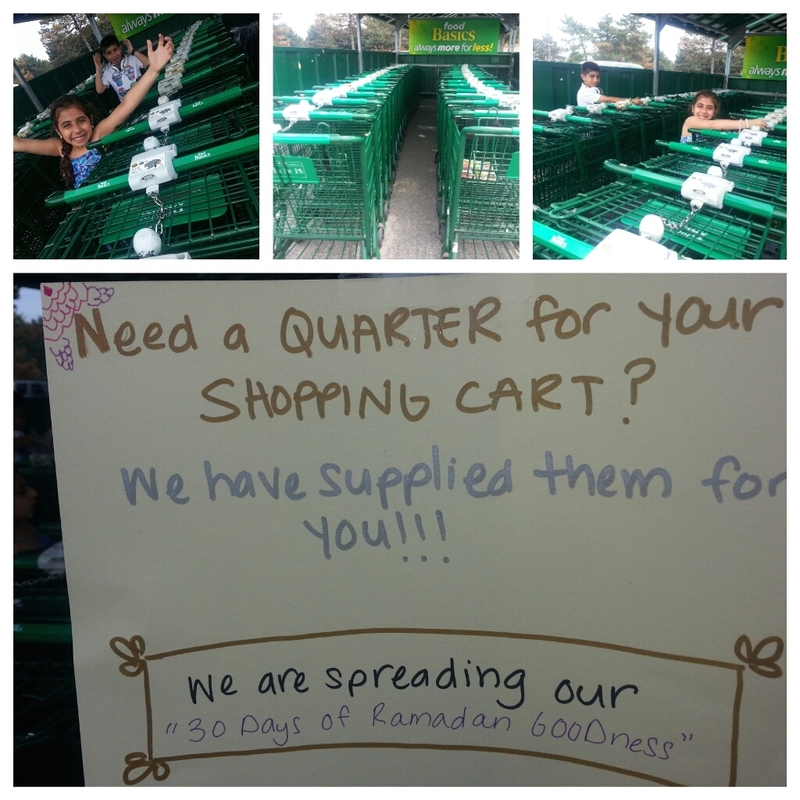 So for Day 2 of Ramadan GOODness the kids thought that it would be great idea to fill all the shopping cart slots with quarters so people would get a nice little surprise when their about start their grocery shopping…spreading some GOODness one shopping cart at a time. Wouldn’t you love to pull up to a drive thru window and have them tell you to put your money away, the order has already been paid for? I would! So in honour of Canada Day we went to Canada’s favourite coffee joint, Tim Hortons, and paid for the orders of the three cars behind us. Then we hid around the corner to see some of the reactions. 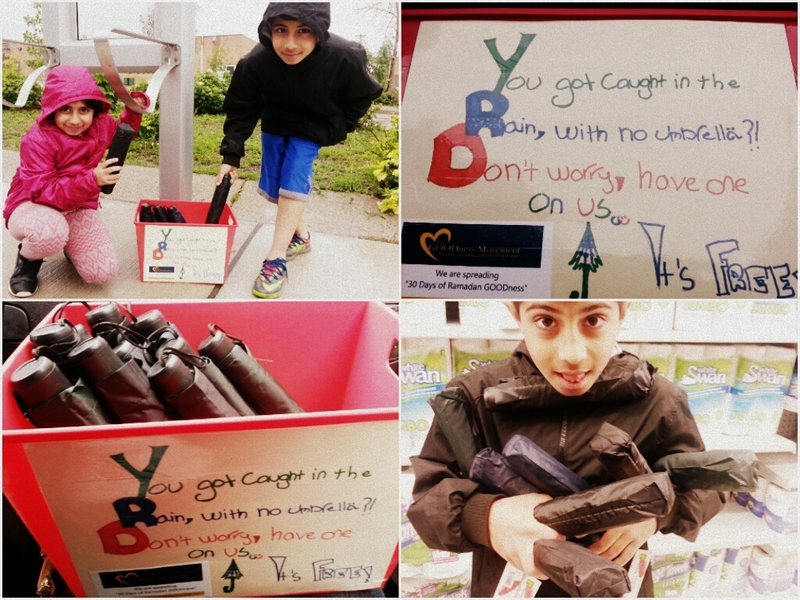 Kids had a blast – Spreading some Canadian GOODness…one coffee at a time! Have you ever gotten stuck in an sudden rainfall, the kind that comes out of nowhere and takes you by surprise? Well that happened today. It started pouring and people on the street were running about trying to get some shelter. So we decided to quickly get a bunch of umbrellas and hand them out to people rushing about on the street. They are so happy they almost hugged us…an then remembered that they were too wet! So for Day 4 we spread some dry GOODness…one umbrella at a time! Everyone that is a parent, or is even close to a child in any way, will share how difficult it is to see your child suffer or fall ill. For Day 5 of Ramadan GOODness the kids decided to help out a sweet little boy by the name of Gabriel. Gabriel Ze’ev (Wolf) Benun was born on October 11, 2011. He was diagnosed with Infant Acute Lymphoblastic Leukemia. Ever since then his inspirational family has been in and out of the hospital, while keeping an amazing attitude throughout! The kids have a collection jar where they have been collecting money all year from various events, birthdays and allowances. They have decided to donate this money to little Gabriel and encourage all of you to do the same. Check out more about Gabriel’s inspiring story and help out as much as you can! Day 6: What parking ticket? You know that feeling that you get when you are walking towards your car after a long day and see that bright yellow piece of paper blowing on your windshield. You get a sudden burst of anger and then regret…and then vow never to park in that place ever again. It happens to me often, too often actually. 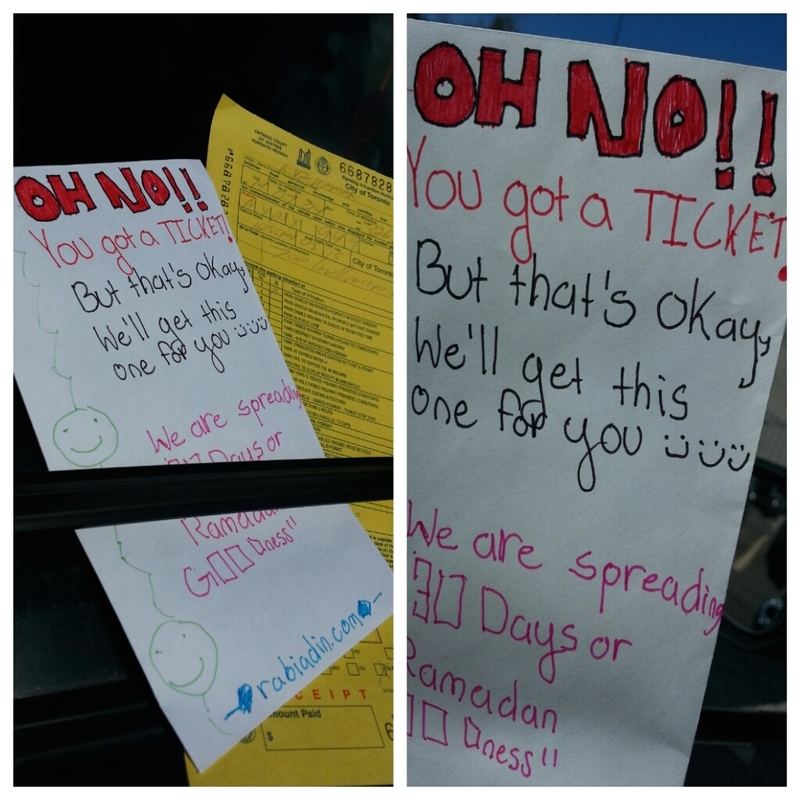 So for Day 6 of Ramadan GOODness the kids decided that it would be great to surprise someone and pay for their parking ticket. We found a car with that scary little yellow piece of paper and stuck an envelope filled with money behind it. Spreading some parking ticket GOODness…on vehicle at a time! My family and I believe strongly in taking care of the environment, and always try to clean up after ourselves as much as possible. This world was given to pure and clean and we should try tour best to leave it as beautiful as possible for our following generations. 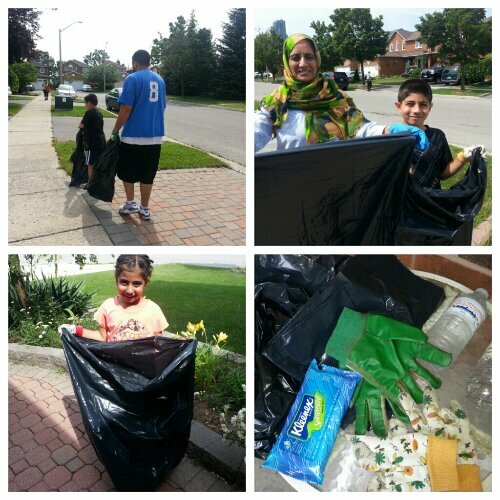 That is why for Day 7 of Ramadan GOODness we head out into the community, armed with garbage bags and a smile cleaning up the streets and spreading some GOODness at the same time! Our mailman in really terrific. Whether it be freezing cold temperatures or blistering heat, he always gets us our mail on time. He even drops by occasionally just to say ‘Hello’ – an all round sweet guy. 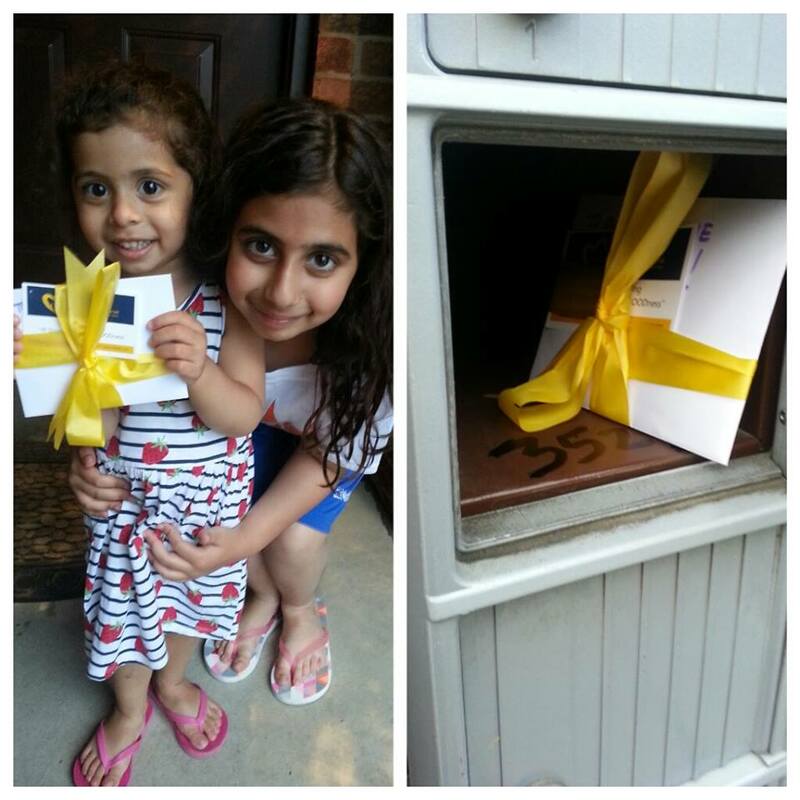 So for Day 8 of Ramadan GOODness, the kids decided to surprise he mailman with a little gift hidden in our mailbox. 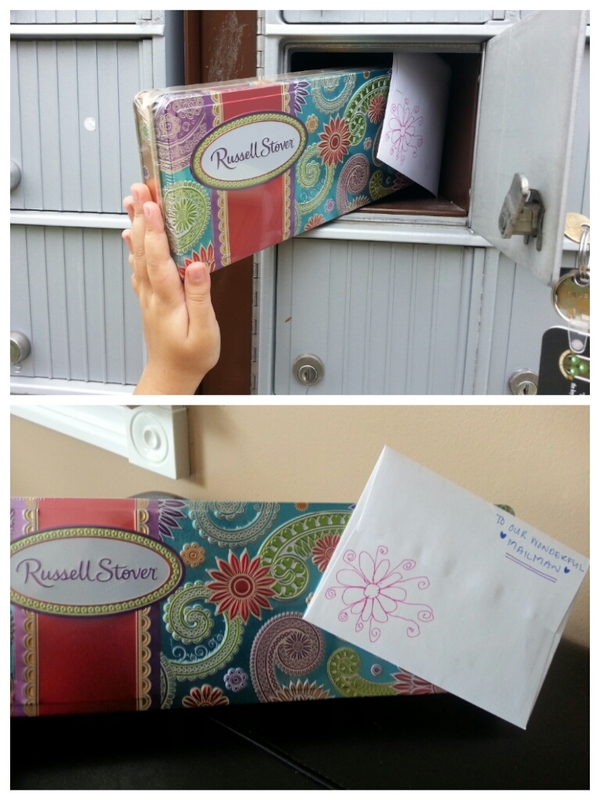 Spreading some GOODness…on mailbox at a time! Have you ever had one of those days when everything just seems to be going wrong – you feel down and tired, needing a little a boost. wouldn’t it be great to hear some kind words, something to lift you right up! For Day 9 of Ramadan GOODness the kids decided to write inspirational little notes and leave them all over the neighbourhood. They left them on cars, random corners and even at the YMCA. 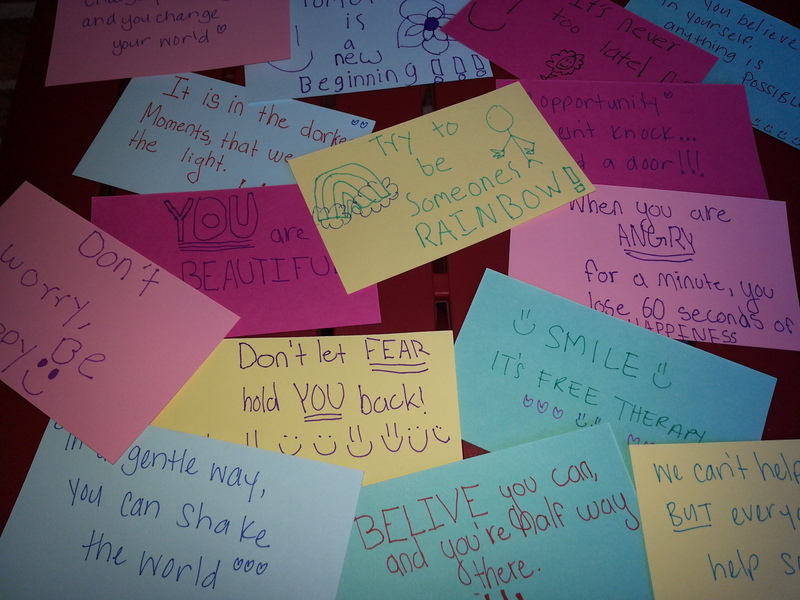 Cheering people up and spreading some inspirational GOODness! Recently a co-worker and good friend of mine lost her father, someone she cherished and misses dearly. For Day 10 of Ramadan GOODness the kids decided that they wanted to make her a ‘cheer you up – care basket’ and filled it with relaxing teas, candles, yummy chocolates, a warm shawl and so much more! They hoped that the basket would bring a smile to her face and some comfort in her heart. Isn’t gas so expensive these days? Makes you wanna cry every time you go to the pump! 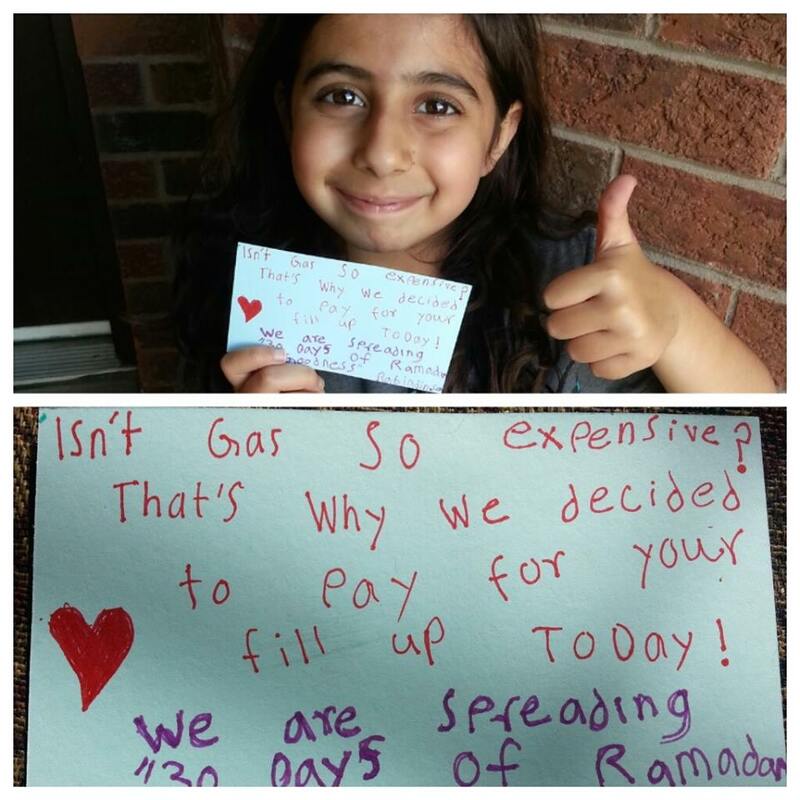 Thats why for Day 11 of Ramadan GOODness the kids decided to surprise a stranger by paying for their gas! We secretly paid at the register while she stood behind us in line and then watched from our car as she walked out smiling and reading our GOODness card to someone on the phone…GOODness mission accomplished! It seems as though every time my family goes out, the kids suddenly get thirsty and MUST have a drink from the vending machine immediately. The only problem is, I never have any change on me! 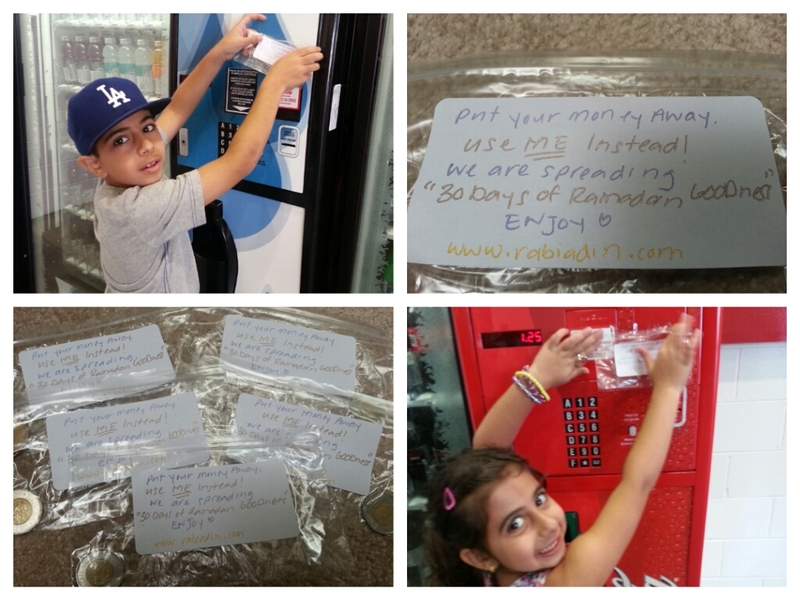 We thought that this might be the problem for many people, so for Day 12 of Ramadan GOODness the kids decided to tape baggies of change to vending machines, spreading some thirst quenching GOODness to the community. 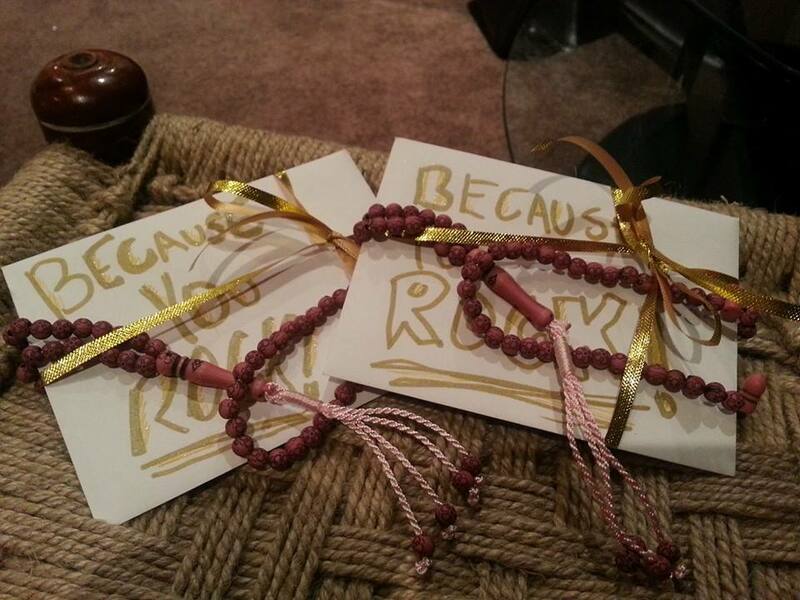 Prayer beads (Tasbeehs) play a very important role in my family’s life. They remind us to remember God in the hard times and thank him in the good times. Sometimes, even just holding my tasbeeh tight has an instant calming effect. 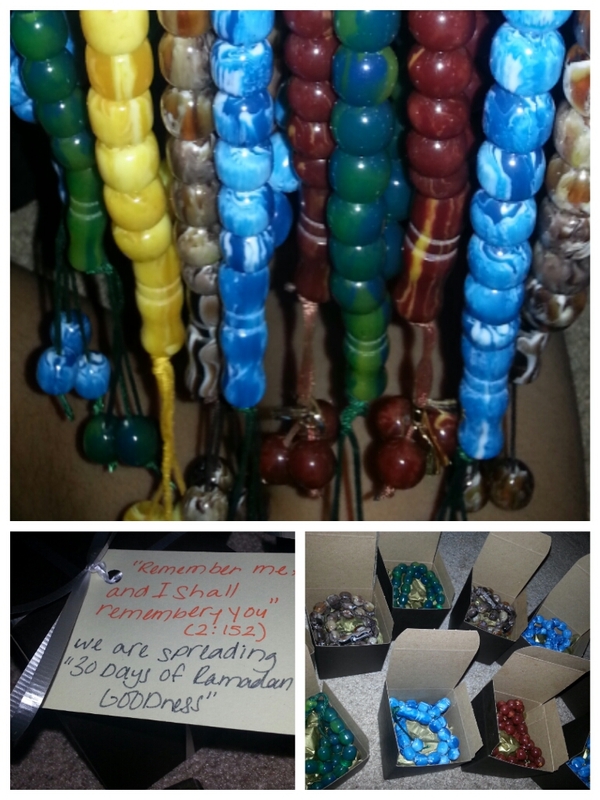 So for Day 13 we decided to wrap up beautiful tasbeehs and distribute them to friends…spreading some calming GOODness! My kids love to read and going to the library is always a fun trip for them! 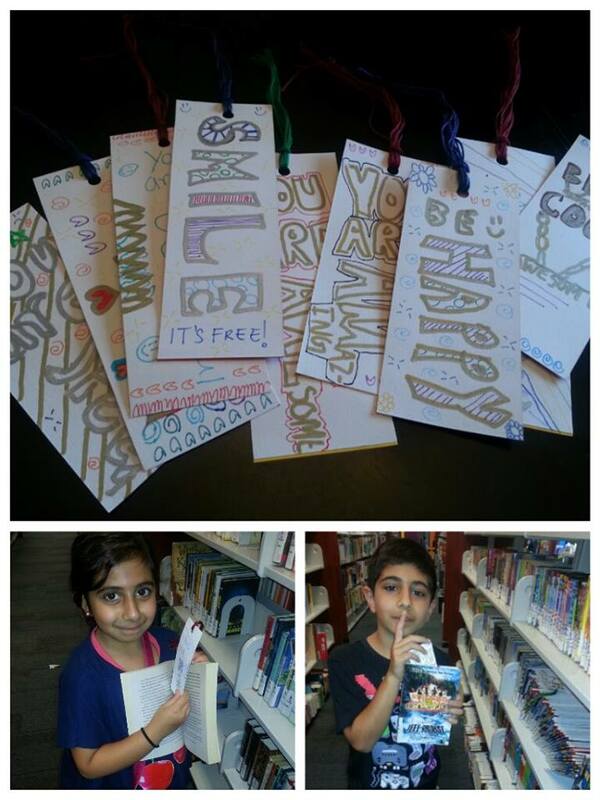 For Day 14 the kids decided to spread some GOODness at the library by hand making inspirational bookmarks and hiding them in books all over the library…hoping to bring a smile to an unsuspecting reader! 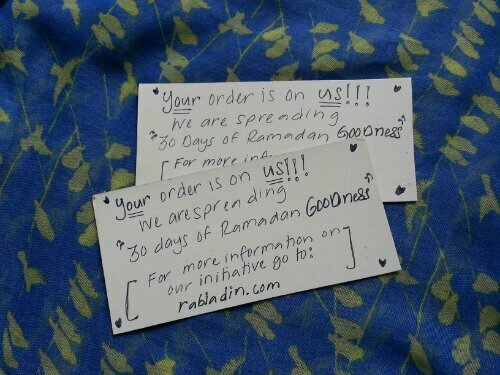 Ramadan is at the halfway mark and we have been busy spreading some serious GOODness! We have terrific neighbours and family that live close by, so for Day 15 we were busy in the kitchen baking cupcakes for everyone and spreading some yummy GOODness. Firefighters put their life on the line everyday to make sure that we are safe and don’t always get the credit that they deserve! 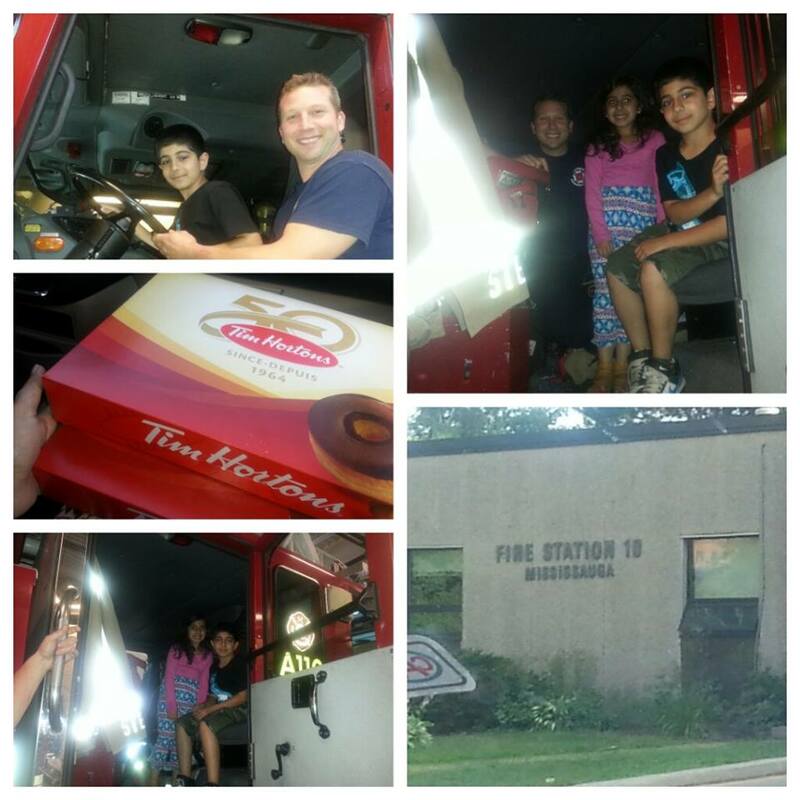 So for Day 16 of Ramadan GOODness we surpised our local Fire Dept with yummy TimHortons treats and they were awesome. They let us sit in the truck, play with the water hose and answered all of our questions…what a blast! Today was a super sunny warm day, the kinda day where the park is packed with laughing, playing kids. The funny thing about kids is that they just keep going, no matter how hot it is or hard they sweat! So for Day 17 of GOODness, the kids decided to spread some ice cold goodness and give out popsicles at the park. We often think of hunger as a problem that is far away from where we live, but the reality is that there are so many people all around us that don’t have access to food. So for Day 18 of Ramadan GOODness we decided to spend the evening volunteering at the foodbank and we had a blast…kids said that this was their favourite day of GOODness so far! We are super tired, but smiles all around! Sometimes it seems as though your day just isn’t going right. You feel kinda down and just need a need any reason to smile. So for today’s GOODness we decided to hand out lots of beautiful single roses to complete strangers! The reaction was so amazing and the kids felt so happy and proud with every rose they gave out…we even surprised a few bikers who couldn’t stop smiling! Success! It seems as though the more we learn about the harmful changes in the environment and desperate state the the earth is moving towards, the less people are paying attention to their roles and impact on the problem. 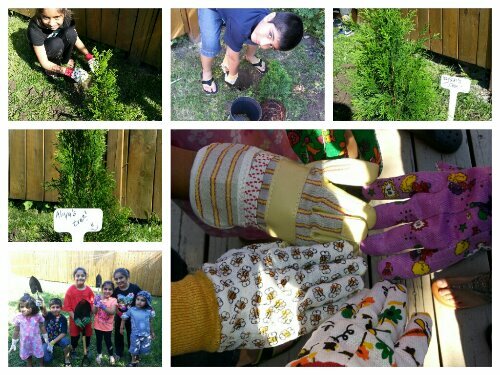 For Day 21 of GOODness we grabbed 15 trees, shovels, soil and a bunch of enthusiastic kids and spent the afternoon planting trees and spreading some ‘Green’ environmental GOODness! 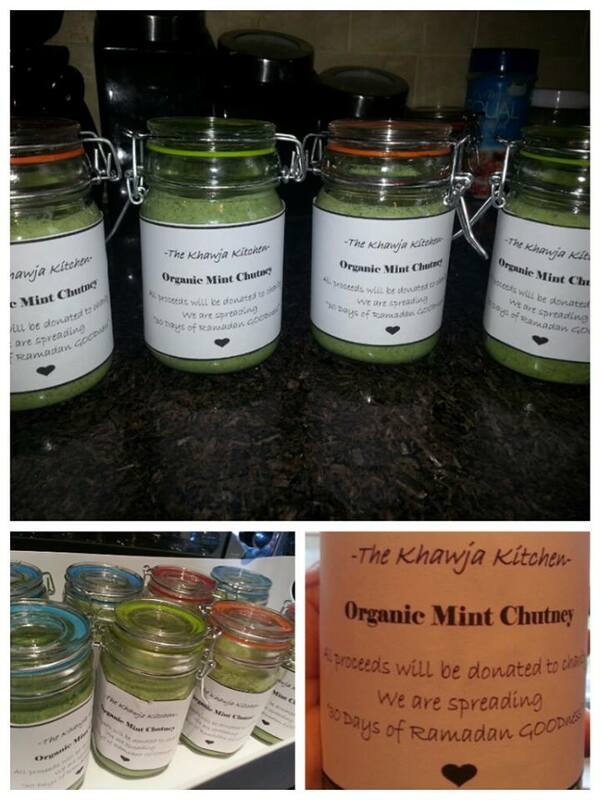 The Khawja Kitchen’s homemade mint chutney is pretty famous in the GTA and we are always distributing it widely. So for Day 22 of GOODness the kids decided to bottle up the minty GOODness and sell it for a good cause. 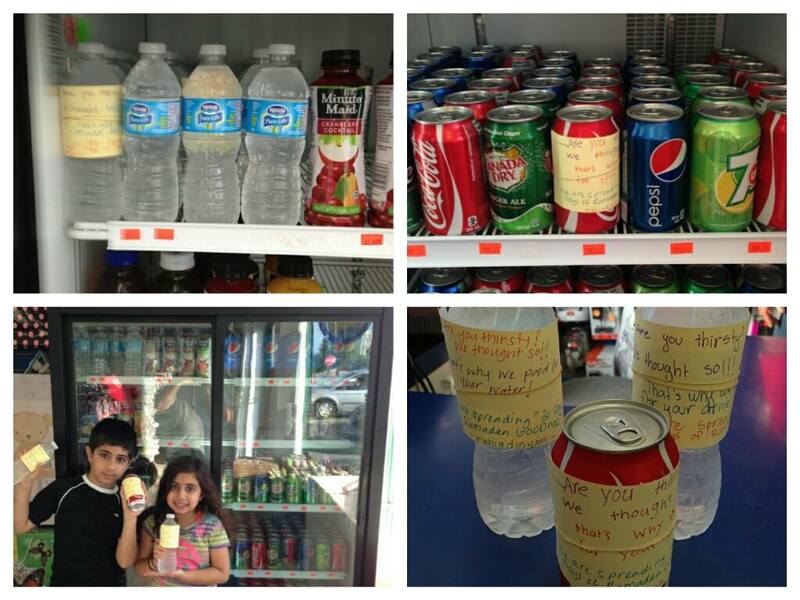 Each bottle is $5 and all proceeds will go to Project Ramadan, a non profit supplying healthy food to those in need! Spreading some minty GOODness and helping provide healthy food to those that need it most! For today’s GOODness we teamed up with the variety store owner to deliver a sneaky surprise. We purchased a bunch of water bottles and pop cans, put the reciept and one of our GOODness cards on each one and then hid them back in the store freezer! That way whenever someone would open the freezer to buy a drink, they would find that one was already paid and ready for them…spreading some thirst quenching GOODness! You know that tired feeling you have when you leave your house in the morning? Now imagine opening your door to an early morning surprise that lights you right up! So for Day 24 of GOODness we made pretty little candle packages with an inspirational message, waited until dark and then left them at random doorsteps around the neighbourhood…spreading some light filled GOODness! Today’s GOODness was one filled with kiddie creativity and heart. We spoke to a group of youth and kids about children around the world living countries affected by conflict, and what they would say to them to make them smile or let them know that we were thinking about them all the way over here. 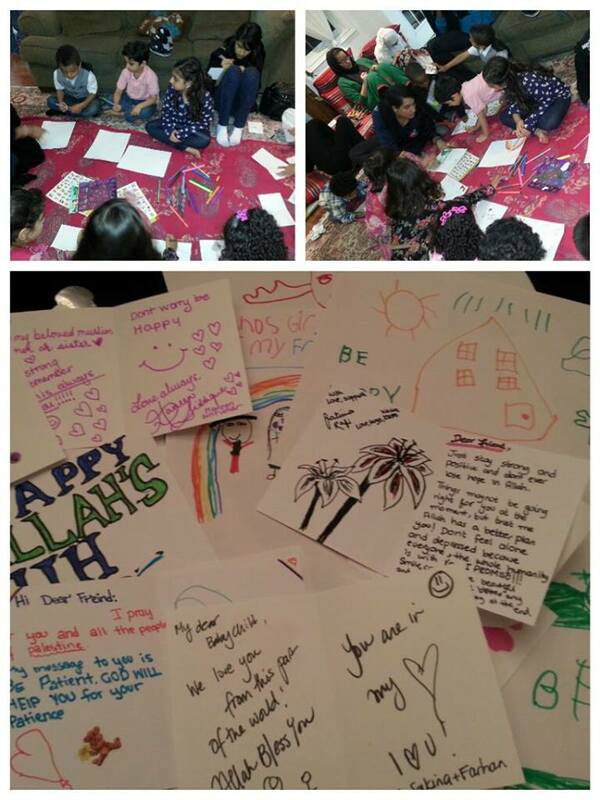 The kids then made pictures, created cards and wrote letters to be distributed to these kids. The letters will be dropped off by hand by a relief agency, to kids living in war torn countries…spreading some international GOODness accross the world! Ramadan is a very busy time everywhere, but it is especially busy for Masjids! Our Masjid has a lot of dedicated volunteers that give their time and energy to keeping the masjid clean and organized every night, and rarely get even a Thank You…so for Day 26 of GOODness, the kids decided to surprise some volunteers with a sweet card and special little gift! Everyone in some way or the other, has been connected to the Sick Kids Hospital… and although its a scary place, the hospital does a great job of making the space warm and comforting. For Day 27 we teamed up with Huma Khawja to make some of the kids hospital stay just a little bit nicer and held a toy drive! We were able to collect SO MANY awesome toys and giftcards, im sure the kids at the hospital will be so excited…spreading some fun GOODness to kids that really need it! 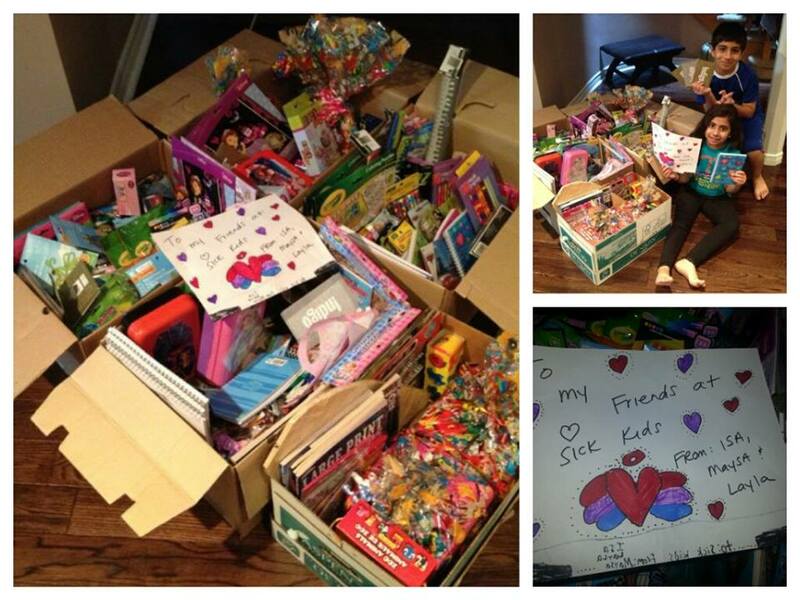 A big THANK YOU to all our GOODness peeps that donated, you guys rock! For today’s GOODness we decided to focus on the women and children close to home that are victims of abuse and neglect . 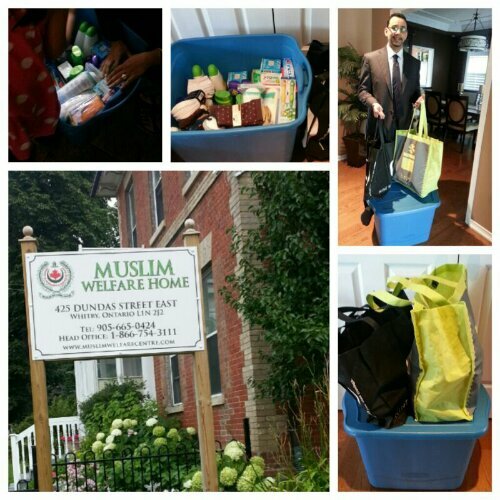 We have been collecting money and items all month for the Muslim Welfare Centre’s Women’s Shelter/Home in Whitby. With so many peoples generous support we were able purchase and drop off supplies and gifts that are surely to brighten up their spirits. Thank you to the Fancy’s Team for partnering up with us for this GOOD deed and to EVERYONE that contributed…you guys are awesome! And with that comes to end another exciting ’30 Days of Ramadan GOODness’ (In case you’re wondering, Ramadan was only 29 days this year). This was the most enjoyable one so far and both the kids, and us adults learned so much about our community and ourselves. We set out to spread a couple of smiles, and as a result kept ourselves smiling and beaming with positivity all month long. This year was especially exciting for us because we able to involve so many of our family and friends and spread some serious GOODness all across the city. The impact that this has had on my family has been greater this year than ever before, and as a result we have decided to continue spreading the GOODness and have challenged ourselves to implement one random act of kindness, big or small, every week going forward. We want to get as many people involved as possible and spread some serious GOODness all year round, Are you up to the challenge? Anyone that has known me for more than a second will attest to the fact that I am absolutely obsessed with South Asian Culture. The food, clothes, poetry, history, people and everything in between has fascinated me for as long as I can remember. So why is that I wasn’t able to openly share my love of all things Desi until far into my teenage years, if not later? Was it the fear of being ‘too cultured’ – is that even a thing? A couple of weeks ago I was at a Bridal Shower, and being my usual competitive self, was nailing all the questions during a wild game of Indian Wedding Jeopardy. It was at that point that a friend turned to me and whispered, “Wow, you’re really cultured, eh?” I smiled (really big), nodded, and then continued on with the shower game madness. But the comment really got me thinking about how far I had come as an individual, and finally being able to feel comfortable being me. Growing up, my school was in an almost completely white neighbourhood and I always stood out…always. I did everything in my power to fit in with the other kids, and failed miserably at it. The fact that I had the beginnings of a femme stache and 4pm curfew didn’t help matters, but that’s another story all together. I was often teased and tormented, which only pushed me further into denying how much I loved and needed my culture, even to myself. My life at home was very different. My parents always encouraged us to be proud of our heritage and try as much as possible to infuse it into every part of our lives. But every time I stepped out of my house, this felt impossible. High school was very different, lots of different cultures and almost half the school seemed to be newcomer Canadians (the terms used back then were not as politically correct). This only complicated things. I was finally given the freedom to express myself and my deep rooted culture, but only to a certain extent. The problem there was not to be so cultured that people would confuse you for a newcomer yourself. Because that would be horrible. *cue sarcastic eye roll* If we’re not going to discriminate against our own people, then who is, right? It was acceptable to identify with my culture, but only in a hip westernized way. So I got my nose pierced, danced to bhangra music and swore in Punjabi…I acted like a brown girl…but within the acceptable Westernized limits. The four years that I spent in University changed me completely. My eyes were opened up to a whole new world of people who did whatever they wanted to do, said whatever they wanted to say, and didn’t really care about others opinions of them. I quickly stopped trying to be down with everything pop culture, and accepted that I wasn’t being true to myself. That’s not who I was. I loved black and white Bollywood movies, listened to Ghazals in my car and read Urdu poetry…all the time. As the years passed, I fell more and more in love with my culture. I became comfortable in my own skin. I was fortunate enough to find a life partner that also understands the importance of holding on to one’s culture (not as much as me, but I’m working on it) and the role that it plays in our lives. 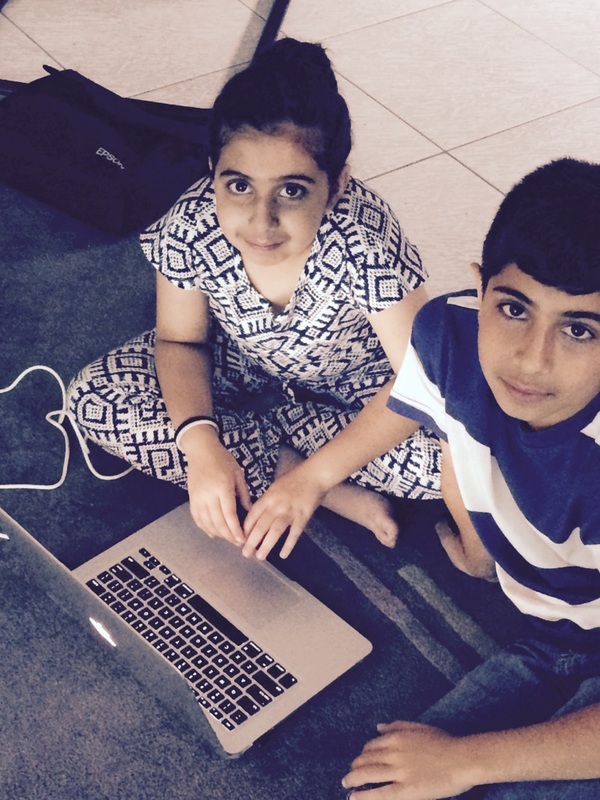 Movie night is often the latest Bollywood release, most family discussions are held in Urdu (okay, maybe not most, but definitely some), and our recent trip to Pakistan had the kids more excited than our trip to Disney World. In the end, it was important for me to understand that the concept of being ‘too cultured’ is completely external. It is something that was, and still is, imposed by Western Culture and expectations. How we confront and question that internalized racism is completely in our own hands. One of the most important decisions that I have ever made in my life, the one that affected so much of who I am today, was the decision to accept my South Asian roots and build a foundation to keep it thriving within my family. My kids will not be embarrassed of who they are, or try to hide it from others…they will learn to find their own perfect balance of culture (whatever it may be) and take pride in sharing that, and themselves, with the world. Why do people perform good deeds? Well, there are actually many reasons; faith, kindness, compassion, concern…but whatever the initial reason may be, one thing is for sure, spreading GOODness around your family, friends and community just feels great! 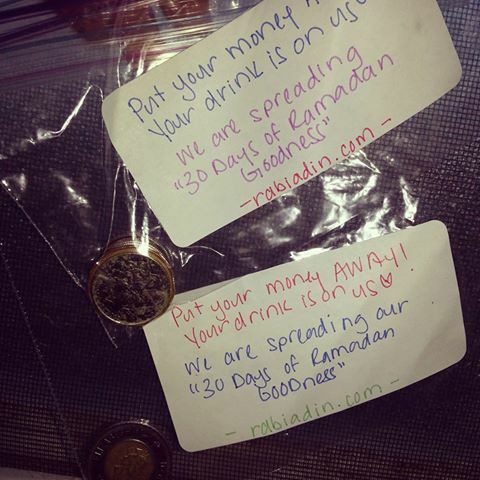 Last year my kids and I started a concept called the ’30 Days of Ramadan GOODness’, where we performed one good deed everyday for the 30 days of Ramadan, and the response was wonderful. Not only were we able to put smiles on the faces of hundreds of people, we felt absolutely incredible doing it! As the days of GOODness passed, we noticed something extraordinary happening; people around us were starting to do good deeds of their own. So this year we are inviting everyone to take part in the ’30 Days of Ramadan GOODness’- and you don’t have to be Muslim get involved! We’ll be visiting different communities and working with many people to spread some serious GOODness within ourselves and throughout our communities. Are you up for the challenge? For the first day of Ramadan the kids wanted to do something crafty and sweet! 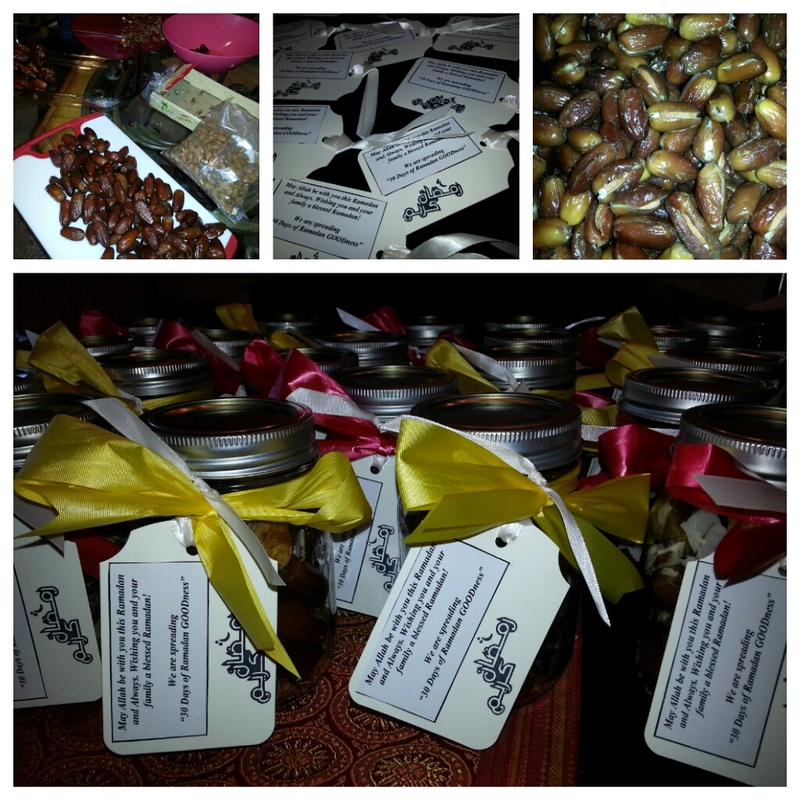 We put together individual jars filled with yummy almond filled dates and distributed them to our family, fiends and neighbours. Eating dates is not only Sunnah, it has many health benefits as well…so for our first act of Ramadan, we are spreading some yumminess…one sweet date at a time. Have you ever had one of those days where you just felt like everything is working against you? Between work, kids, family and everything in between, the day can sometimes leave you feeling unmotivated and down. Wouldn’t it be great to come across an inspirational idea, something that will just lift your spirits right up… that’s what Day 2 was all about. For Day 2 of spreading Ramadan GOODness, the kids and I put together inspirational notes and left them on the windows of random cars, spreading some GOOdness…one inspirational note at a time. You know that feeling you get when you’re really hungry, the one that makes you get up right away and walk towards the fridge to dig in…now imagine going to that fridge and realizing it is empty. There are so many people in this world that do not have access to food and water, it makes us feel so blessed for everything that we have. For ’30 Days of Ramadan GOODness’ Day 3 we have decided to provide food to a family for the entire month of Ramadan. The kids have been saving up money throughout the year, and with a little top up from us, we were able to spread some healthy GOODness…one meal at a time! We are always trying to teach our kids the importance of respecting nature and appreciating the natural beauty that God has surrounded us with. These days we hear so much about trees being cut down and our forests being destroyed, but very little is being done about it. There are many reasons why trees are important to our existence; they clean the air, provide oxygen, are used as animal habitats, and so much more. 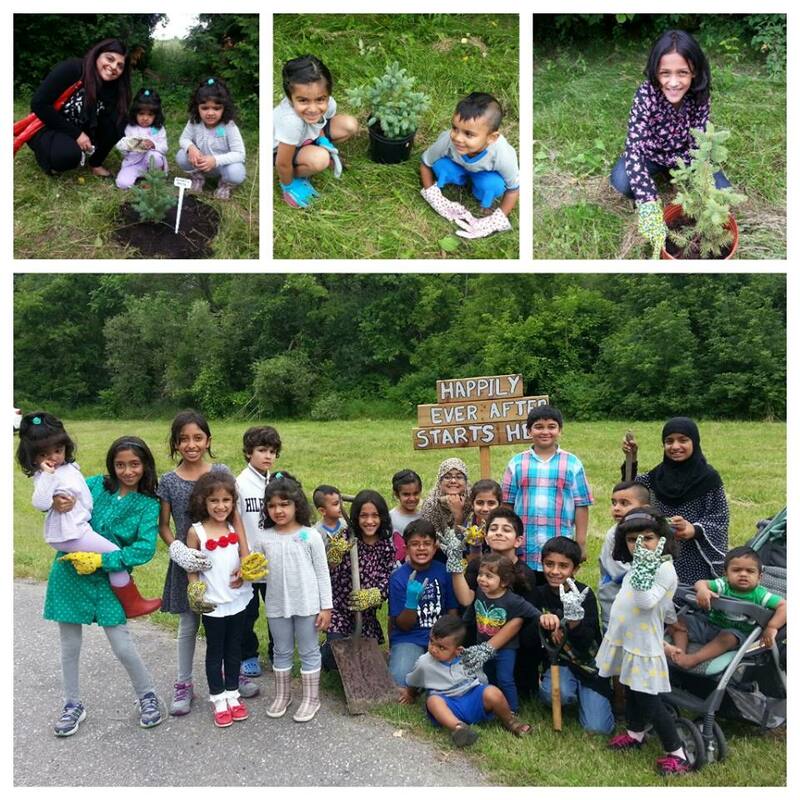 So for our ’30 Days of Ramadan GOODness’ Day 4, we decided to team up with our family and plant some trees…spreading some green GOODness with our tiny little friends. Day 5: Your order is on us! If your like my family, you use the drive thru a lot (mostly for Tim Hortons, yum). Now imagine getting to the window and having them tell you to put your wallet away, your order has already been paid…how great would that be! 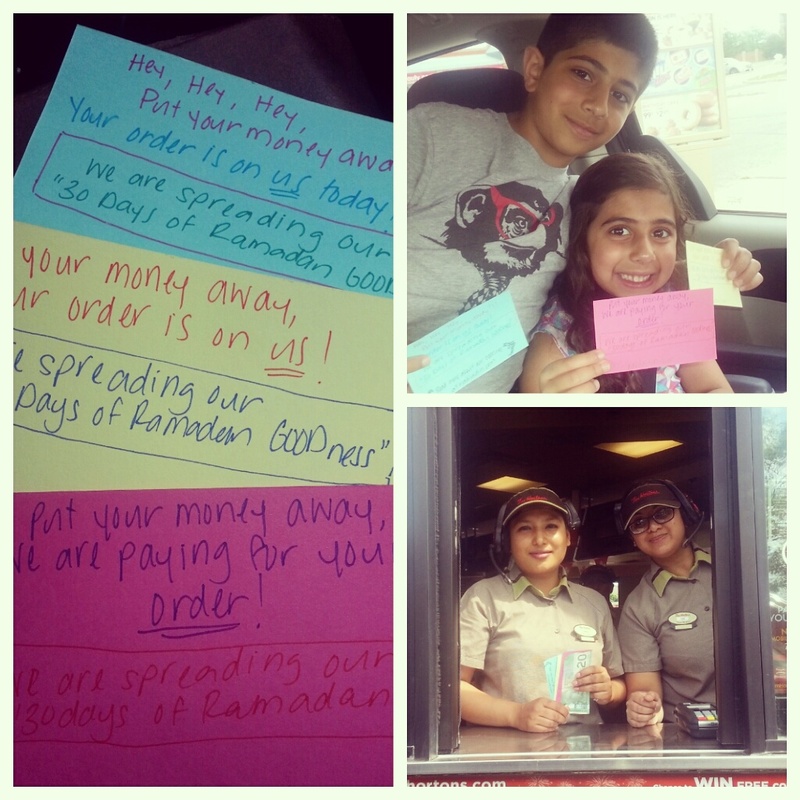 For Day 5 of Ramadan GOODness we decided to spread some GOODness at the drive thru window. We went through the drive thrus and payed for the car behind us, then asked the associate to hand the car a card that read “Your Order Is On US!” , so much fun! Spreading some Ramadan GOODness…one drive thru at a time! Life can sometimes feel like a roller coaster ride, with ups, downs and often…complete turn you upside loops! The one thing that I have found to always bring peace to my heart and mind, is remembering Allah and all that he has blessed me with. It is said that when someone opens their soul to their lord, he finds an increase of strength, faith and conviction. 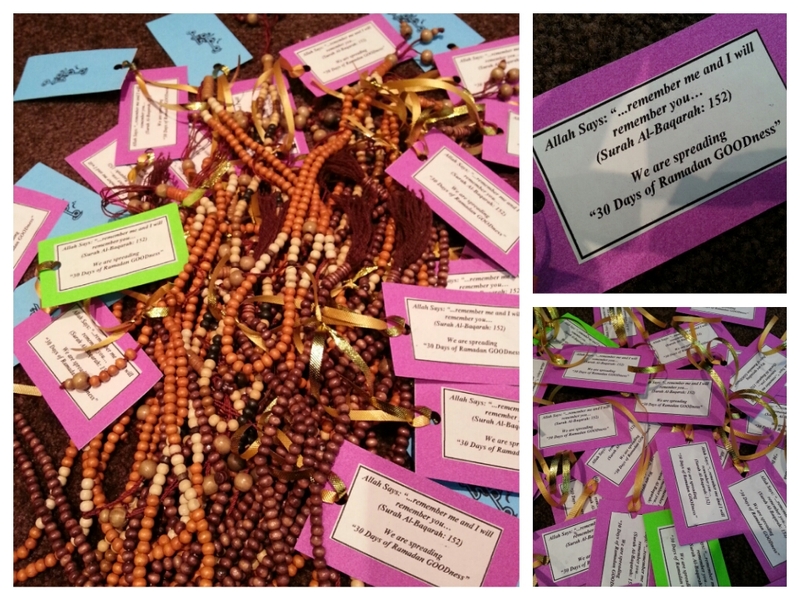 On Day 6 of spreading Ramadan GOODness, we are distributing Dhikr chains/Tasbeehs with the hopes that people will be encouraged to turn to Allah in both good times and bad. 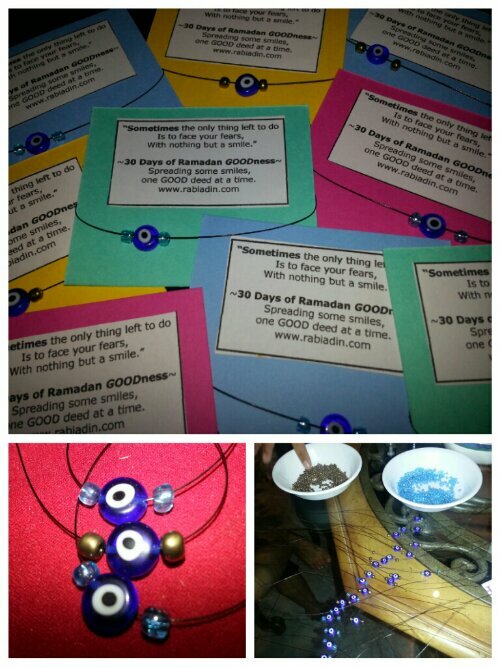 Spreading some Ramadan GOODness …by purifying hearts and souls through Dhikr! Donating items to a Food Bank is quite an easy thing to do and spreads some serious GOOD at the same time. Donating items can make a difference for individuals struggling to make ends meet by helping to stock their fridges and cupboards with nutritious food…something that everyone should have access to. So for Day 7 of Ramadan GOODness, we are collecting canned food items, and asking our friends, family and neighbours to do the same. Spreading some very important GOODness to those who need it the most! You know those sirens that race pass you on the road, other than moving to one side, have you have stopped and wondered where they are headed? What dangerous situation they are about engage in? How many people’s lives they are about to save? 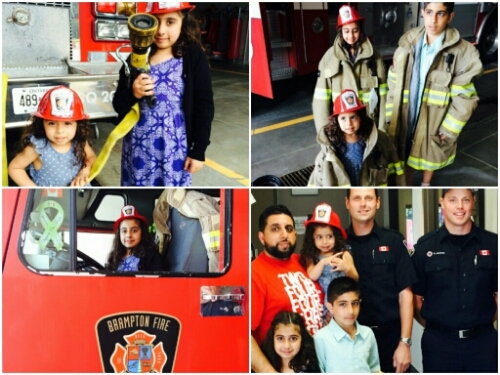 For Day 8 of Ramadan GOODness, we decided to bring a yummy chocolate surprise to a group of people that are spreading some serious GOODness of their own, by saving lives and keeping our communities safe…our fearless heroes…our community firefighters! Going through the daily news stories, my sister in law came across an article about a local Mississauga community that got hit pretty hard by the recent flooding. The story focused on one man, Ken Hills, that was renting a basement apartment in the area, who was hit pretty bad. The man was unemployed, with no family when the flooding pushed him out of his home and into a tent in a neighbours backyard. The article had reached out to readers to do whatever they could to help out, food, clothes, money…anything. So for Day 9 of Ramadan GOODness we surprised Ken with bags of nutritious food, water, and some basic necessities. Spreading some GOODness to a local flood victim. Day 10: Baked goods for our neighbours! My family believes strongly in not only respecting our neighbours, but also going out of our way to ensure that we have positive and friendly relationships with them. Being kind to your neighbours is more than just the morally appropriate thing to do, it also outlined clearly in most religions. 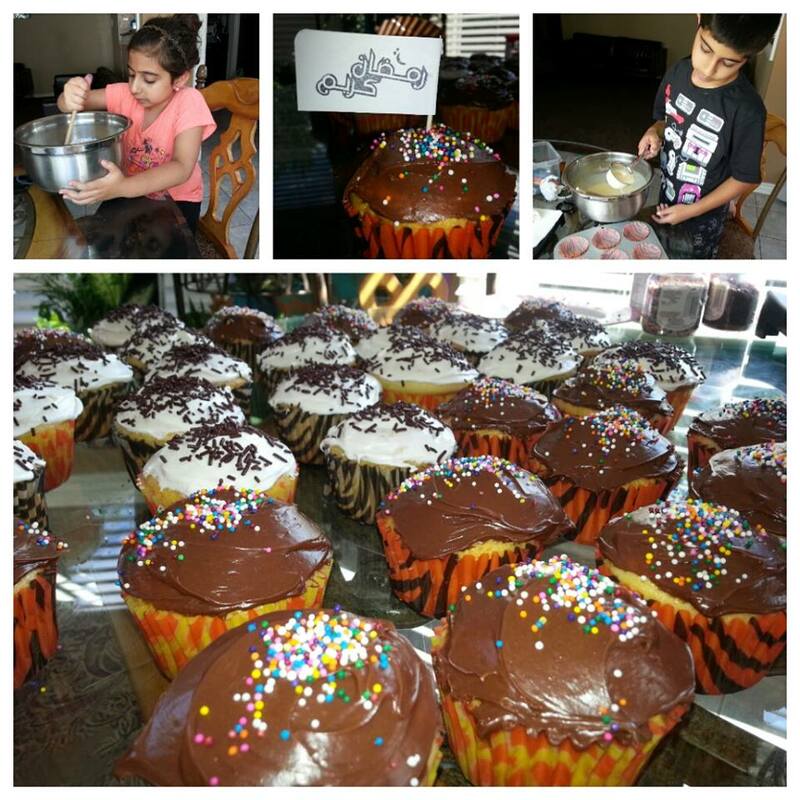 So for Day 10 of Ramadan GOODness we decided to spread some yummy GOODness for our neighbours…one cupcake at a time! No matter how strong a person is, no one can bear to see a an ill child…it breaks the toughest of hearts. My sister in law does an annual toy drive, where she collects money and toys for children at the Sick Kids Hospital, and it has been quite successful in the past. For Day 11 of our Ramadan GOODness, we have teamed up with her and have both donated toys, as well as collected from friends and family to donate as well. We are spreading some serious GOODness with this one…to tiny little hearts that need it the most! I am a strong believer that we were intended to leave this world as we entered it, however if you look around it is quite obvious that this is not the case. We live in a beautiful residential neighbourhood, lots of great people and breath-taking nature…but through time people have littered the community, taking away from its natural beauty. 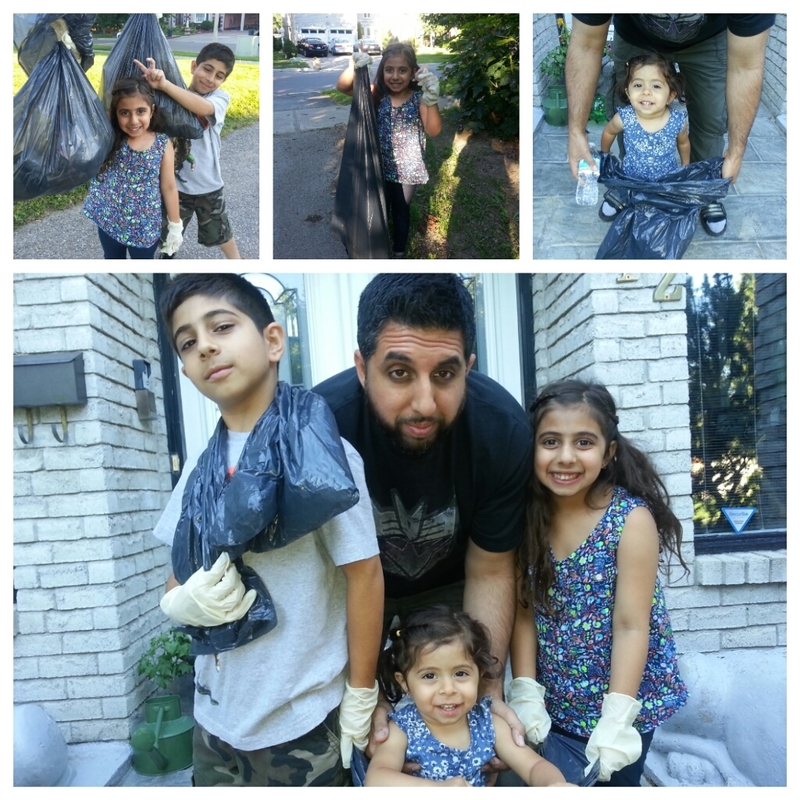 For Day 12 of Ramadan GOODness we are grabbing the family, a few big garbage bags and a pair gloves…we’re going to head out into the community and pick up any litter that we can see. Beautifying our world, one community at a time! Day 13: Vending Machine Surprise! You know when you really need to get a drink or something to snack on, but don’t have enough change for the vending machine…it is the plastic card generation you know! Well, for Day 13 of Ramadan GOODness, we decided to surprise people at vending machines with Tooonies taped above the coin slot in little plastic bags…imagine something like that happening to you, it would definitely make me smile ear to ear! Spreading some GOODness…one refreshing drink at a time! Everybody could use a little inspiration in their lives, especially after a long day at work or running around completing errands. 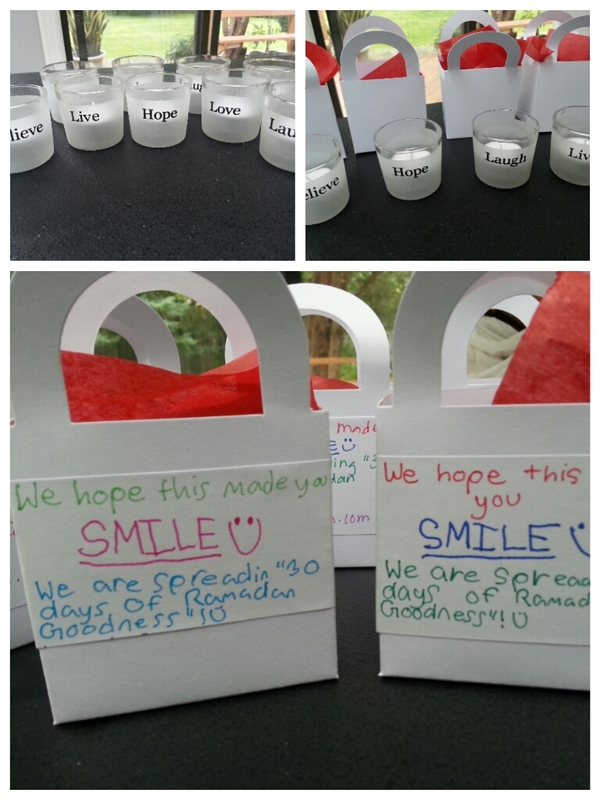 For Day 14 of Ramadan GOODness we decided to purchase inspirational little candle holders, wrap them up nice and pretty, and secretly leave them on the doorsteps of random houses…hoping to bring a smile to someones face and shine a little light into their lives. Day 15: Visiting with Seniors! I have always believed in the importance of learning from and respecting our seniors. Unfortunately, it seems that society has slowly started ignoring that aspect of our population…seniors homes are filled with residents that have been forgotten by their families and left alone. 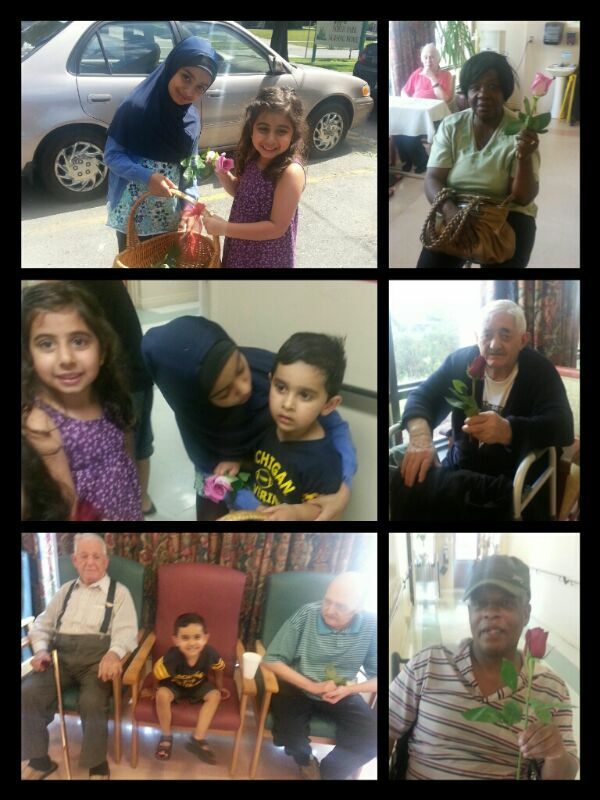 Today we decided to team up with our cousins and spread some GOODness in a seniors residence. We hung out with the residents and handed out roses to everyone we met, spreading some happiness to the wisest members of our community! We live in a community with lots of beautiful birds chirping away their merry songs all day long. 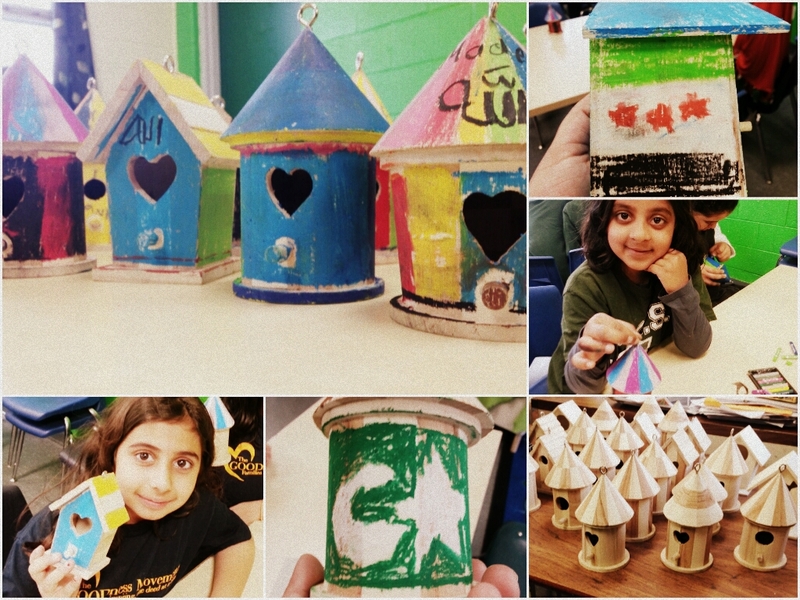 For Day 16 of Ramadan GOODness, we decided to hand paint some cute little birdhouses and hang them on trees throughout the neighbourhood. There is a park down the street that was hit pretty hard by the storm two weeks ago, we decided to focus on those trees…beautifying our community park and bringing some yummy GOODness to our little feathered friends at the same time! Have you ever looked around while pumping gas, everyone looks so sad, my theory; Gasoline is too expensive! But regardless of how high the prices soar, people are always going to need to fill up, surviving without a car is becoming just way too difficult. 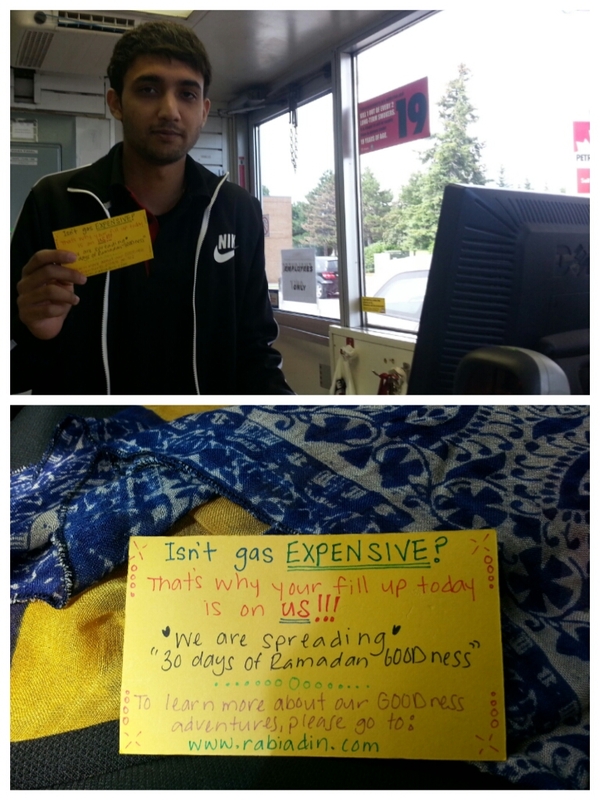 So for Day 17 of Ramadan GOODness, we decided to put a smile on a commuters face by anonymously paying for their gasoline fill. We handed the cashier a card that said this gas was on us, payed for the fill and literally ran out the door so as not to be spotted…spreading some GOODness, one commuter at a time! I love the rain, listening to it while I sleep, watching it through the window, even the smell makes me happy…but one thing that I do not like, is being stuck running around it! 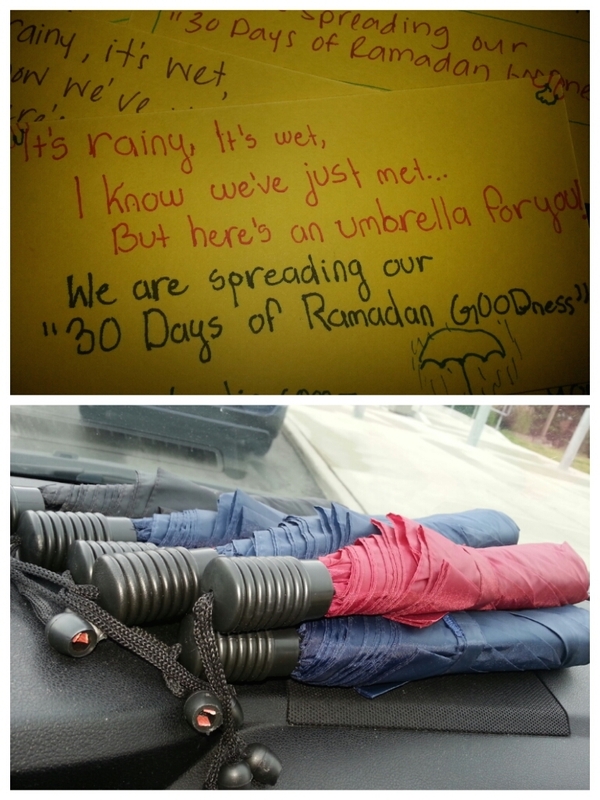 For Day 18 of Ramadan GOODness, we drove around in the pouring rain and handed out umbrellas to pedestrians caught in the down pour. 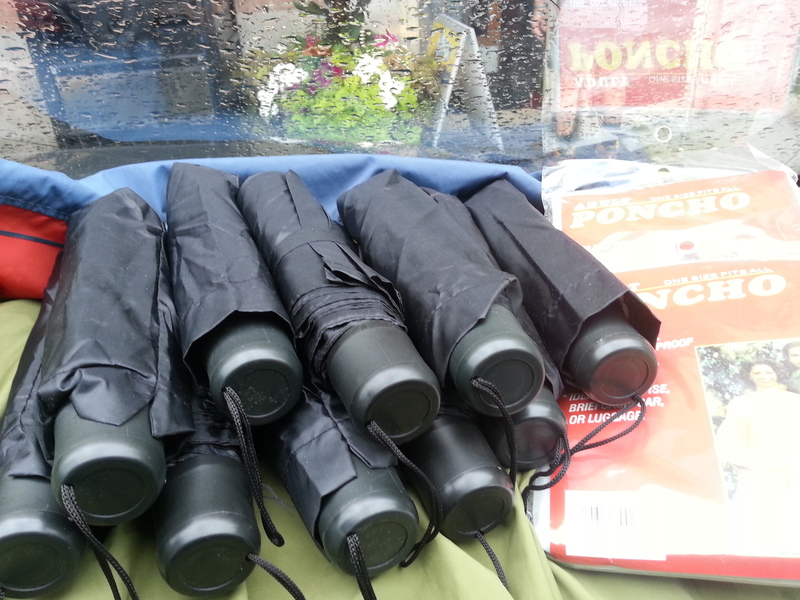 We came to the wet rescue…with some good old fashion umbrellas! The passing of someone close can leave a person feeling empty and alone, with the healing process taking months or years. 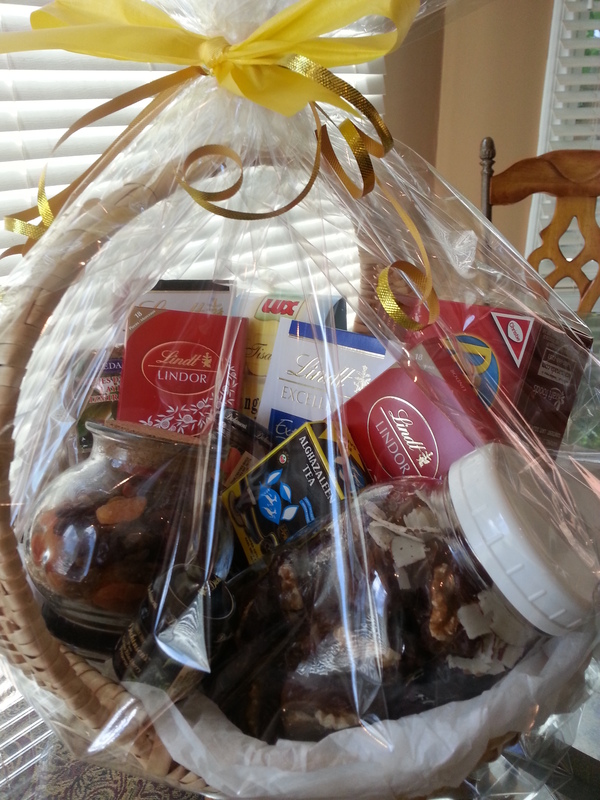 For Day 19 of Ramadan GOODness, we decided to put together a GOODness basket with yummy treats and healing teas for someone we know that is going through this difficult healing process. And although a basket of goodies isn’t much in comparison to the grave loss, we’re hoping that this little bit of GOODness will brighten her day! Have you ever been waiting for something to arrive in the mail? A letter from a loved one, an acceptance letter, that package you have been awaiting…it is the mailman that assures that all those important documents get to you on time. No matter the weather, our mailman has always delivered our mail on time and with an extreme amount of care. 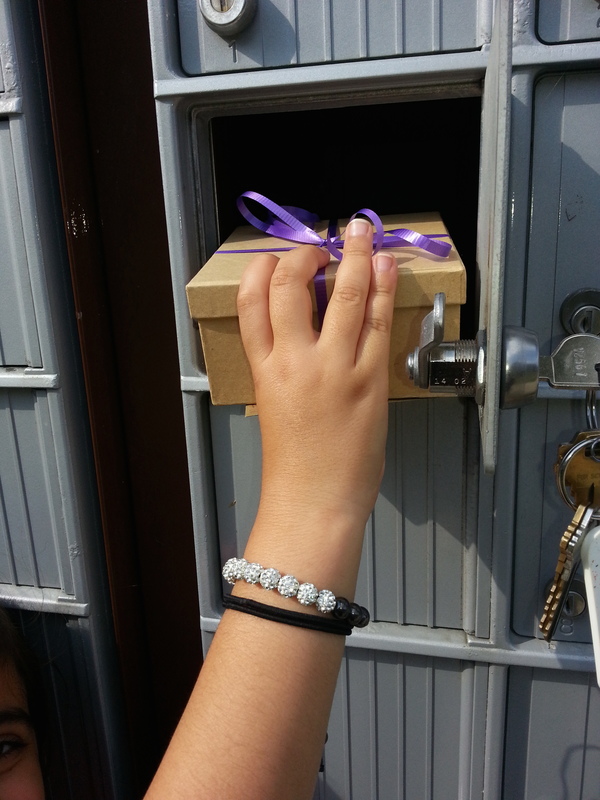 That is why, for Day 20 of Ramadan GOODness we decided to surprise our mailman with some yummy chocolates…yummy GOODness! 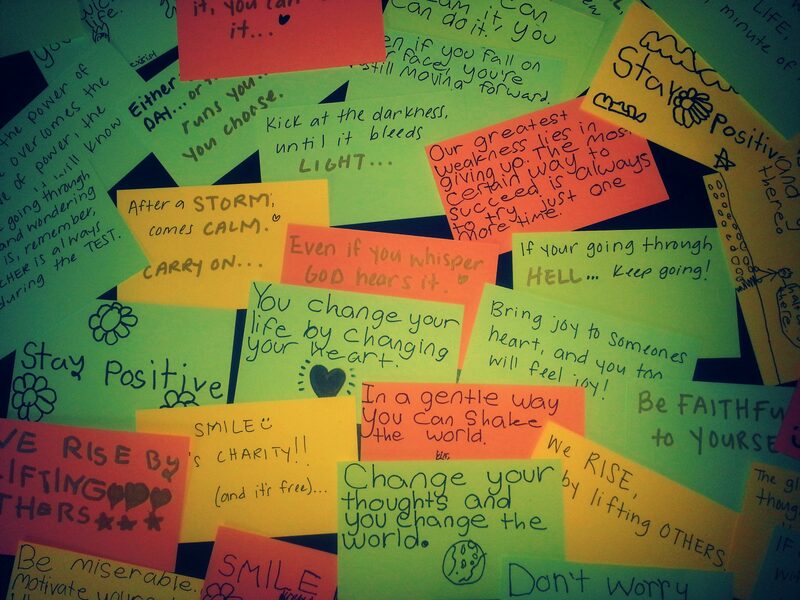 Day 21: Some SMILE inspiration! I am a strong believer in the power of smiling, it not only cheers you up, but is also highly contagious…before you know it, everyone around you will be smiling too! The only problem is, people these days are walking around with so much in their minds. Balancing busy schedules, family, work and all the ups and downs that are guaranteed with life, people are forgetting to smile and be grateful for everything that they have been been blessed with. 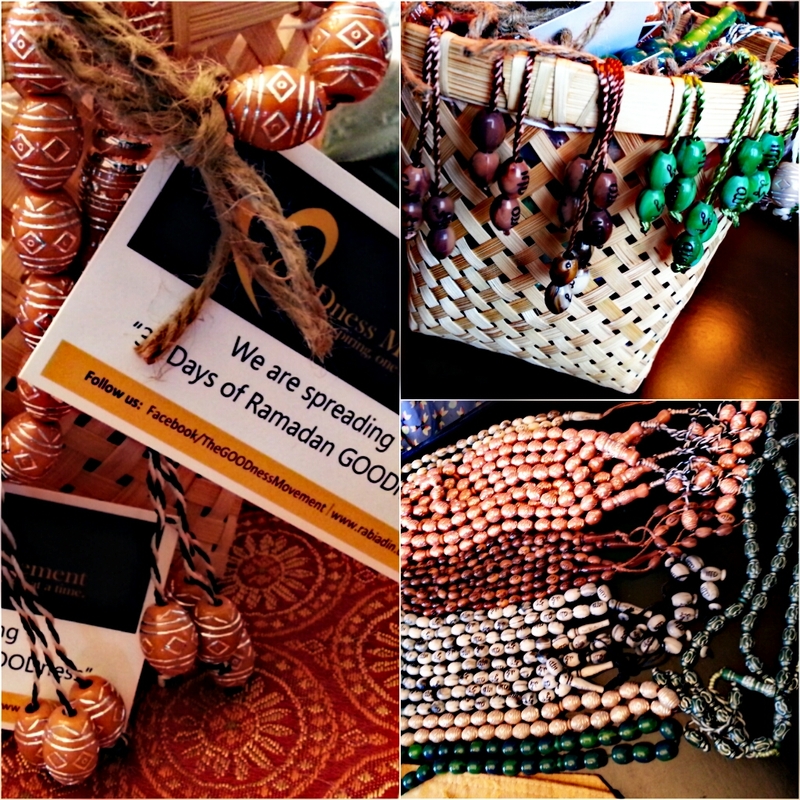 For Day 21 of Ramadan GOODness, we decided to inspire some smiles with a nice thought and hand made bracelets…hoping to spread some GOODness, one smile at a time! For Day 22 of Ramadan GOODness, we decided to team up with our family and spread some GOODness to a Muslim Women’s Shelter. 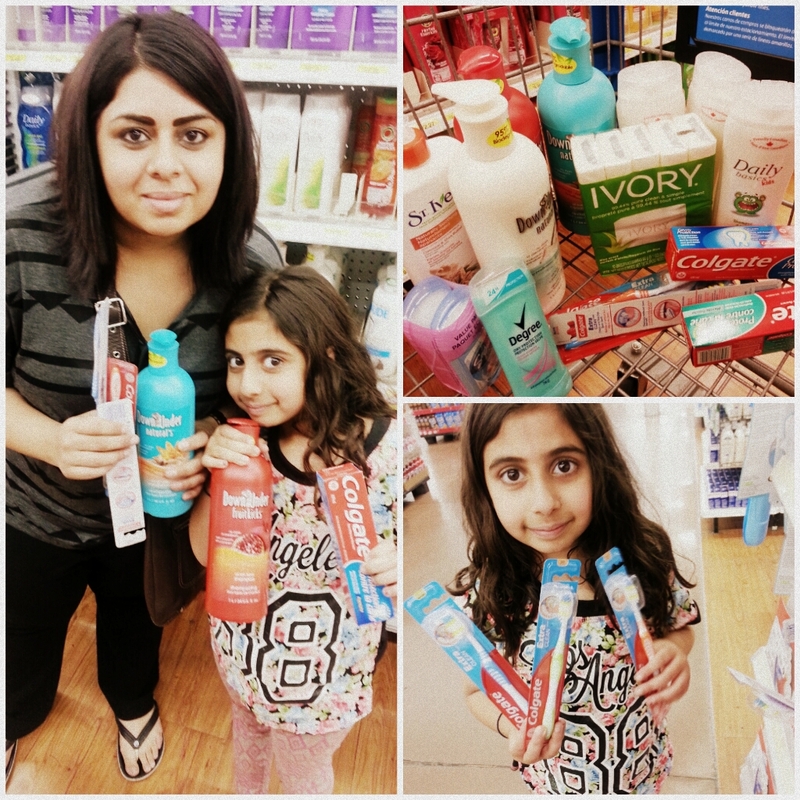 We purchased some staple items that they requested such as towels, bed sheets, and lots of toiletries. We drove down to the shelter and personally dropped off the donations…which was such a humbling experience. We were able to tour and learn about the facilities, see some of the residents and discuss in more detail what the shelter could need in assistance for the future. We were able to teach the kids about a seriously important component of our society and learn about the importance of being grateful for everything we have…spreading some GOODness and helping some wonderful women at the same time! 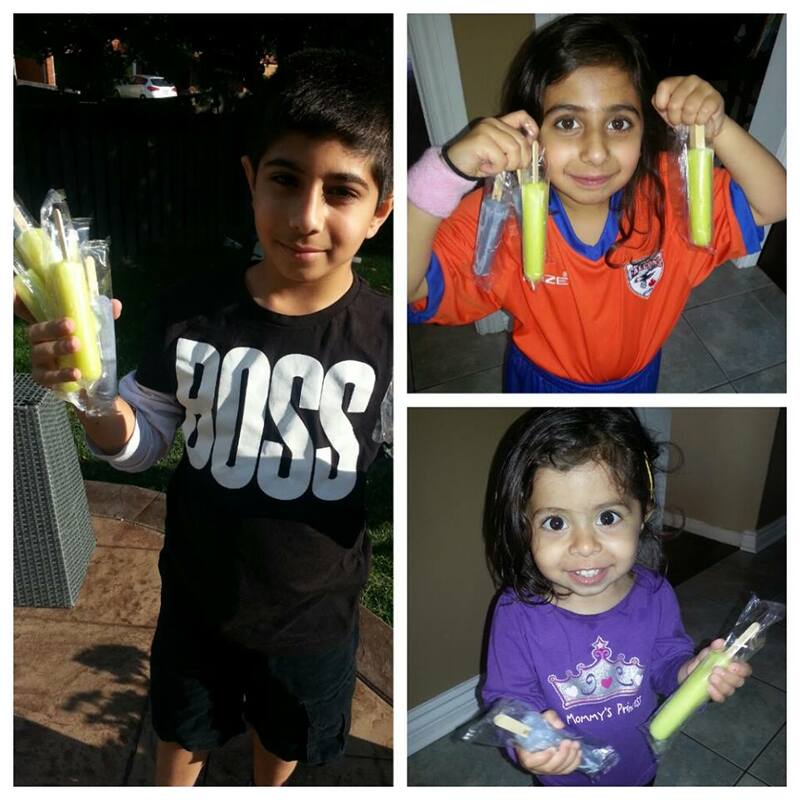 cold freezies! Spreading some chilled GOODness in the summer heat. This day of Ramadan GOODness was a very important one. Did you know that there are over a billion people in this world that do not have access to clean water or sanitation. The worst part is that the water is available…its just not reaching the people that so desperately need it. That is why for Day 24 we decided to give someone across the world the gift of WATER. We used http://www.water.org as our donation source, we have used them in the past and they are doing some great work to help people that need it the most…spreading some GOODness, one drop at a time! 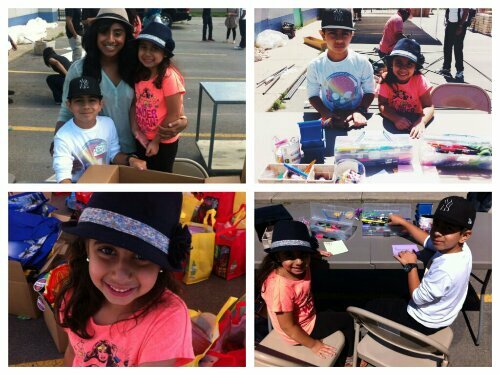 For Day 25 the kids decided to volunteer their time with a local initiative called Project Ramadan. 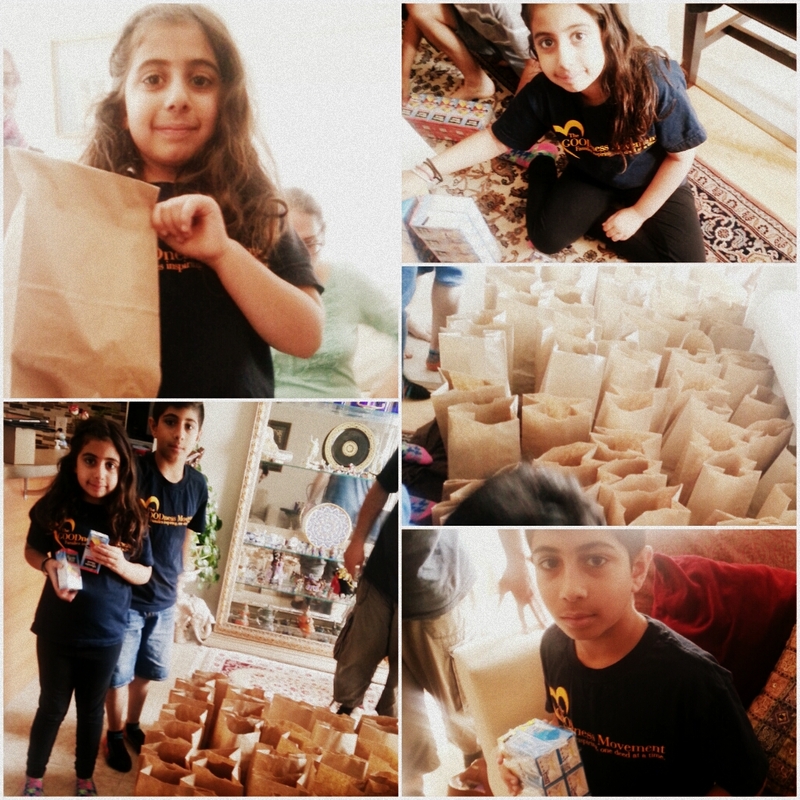 Project Ramadan creates packages full of nutritious food and distributes it to those in need. Ever since this initiative started a couple years back, I have been mesmerized by the great work that they do. The kids had a great time helping out and were able to spend the day with their aunt as well…double the GOODness! Today we decided to honour another one of our local community heroes…those that keep us safe and create order in this hectic world, our local Police Department. We kids surprised the officers with one our favourite treats Tim Hortons Donuts (I know, how cliché of us). 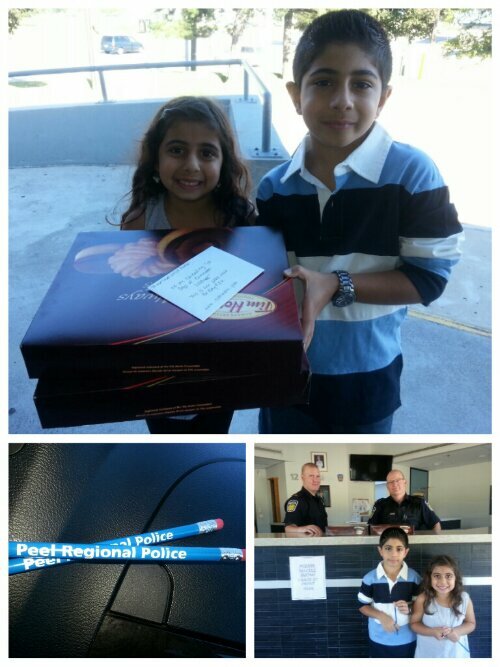 The officers were really surprised and loved the treats, they even gave the kids little souvenirs as well! Spreading some GOODness to those that keep our communities safe! Have you ever noticed how unhappy our city’s drivers look? 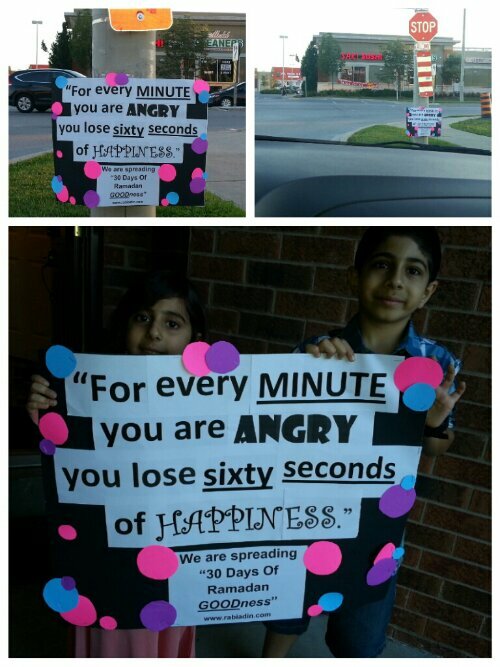 Being struck in rush hour, endless red lights and inconsiderate commuters sharing the road, will definitely leave anyone with a feeling of anger or anxiety, For day 27 of Ramadan GOODness, we decided to add some inspiration for our local commuters by putting up a motivational sign at one of our busiest intersections…hoping to bring some happiness to an everyday route! How horrible does it feel to be sick? You are at home, bored, possibly in pain and cut of from the beautiful summer sun…and if its an unfortunate situation with longer recovery time, every day just seems endless. 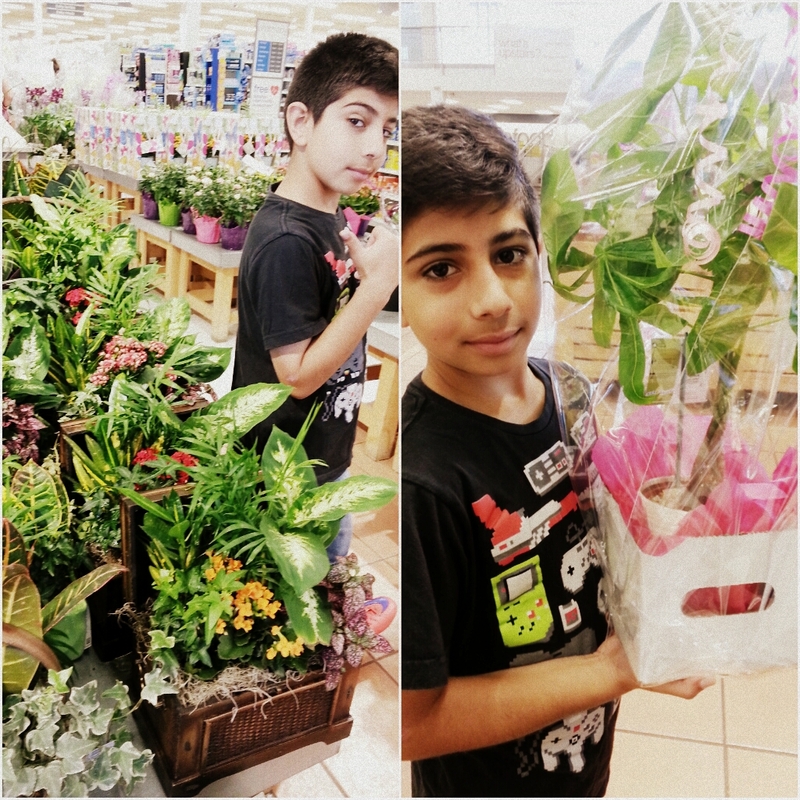 For Day 28 of Ramadan GOODness, we decided to visit with someone that has just had surgery, bring her some pretty flowers and cheer her up as best we can…spreading some much needed GOODness to someones day! We have a really big family, which makes Eid celebrations so much fun! In anticipation for Eid tomorrow, we have decided to bake a big (huge) batch of Eid Mubarak cookies. The process in it self spread some serious GOODness, as we brought the family together for many hours preparing, baking and decorating the cookies. We made moons, starts, lanterns and tiny little mosques to share some yummy GOODness with our extended family on this very special day…spreading some GOODness one cookie cutter at time! After 29 days of running around spreading GOODness to our community, family and friends, it is a little sad to finally bid farewell to Ramadan. Throughout the month, our family was able to learn so much about community, social issues, and the power of making others smile…and because of this, we actually ended up learning a great deal about ourselves. I believe strongly that every GOOD deed, no matter how small, has a big impact in the universe. I pray that throughout this month, my family and I were able to touch people, if even in a little way, and spread some smiles to those that needed it the most. The whole month went by so quickly, and the kids are already thinking about exciting ideas for next year…until then, we are still challenging ourselves to spread some serious GOODness whenever possible…are you up to the challenge? Last night I came to a sharp realization; My parents are getting old. Not a completely new realization of course, it’s something that I have been thinking about for some time now, but it wasn’t until this cold quiet night that it really hit home. My father sat wrapped in a comforter half asleep in front of the television, while my mother slowly sipped away at her tea, lowering the warm cup to sooth her sore throat every few minutes. I kept going back and forth between the two, I just couldn’t pull myself away. I’m not sure exactly what I was feeling or how to describe it…but it felt heavy in my chest and I could barely choke back my tears. Parents get old and with age comes the inevitable; this is the natural circle of life, but knowing that doesn’t make it any easier to accept. My parents have always been like heroes to me. Like many immigrants, they left their family, friends and everything that they held dear to come to Canada and start a new life for themselves. They worked hard…really hard…to provide us with everything that we could possibly desire. And it’s not just the financial aspect, any parent could have done that, it was and still is, the unconditional love and support that really stands out. They were there through every difficult time, stayed up with me during long sick nights, encouraged and supported many of my wild adventures and were always there…always. As they get older, the tables are slowly starting to turn, and I am finally being given the opportunity to do something for them. These are small things, nothing that could ever amount to all that they did for me, but let me tell you, it feels great…feels right. I often hear people talking about what little time they have to visit their parents, their lives are just too busy to take the kids over to play or drop by for a family dinner. Seriously? After spending their entire adult lives caring for us, our parents are finally at a place where they need us-and we don’t have time for them? And let’s just put time aside, many of us don’t even have the patience to have a conversation with our parents. We are easily annoyed, refuse to repeat a thought more than once, and often end off with a disrespectful dismissal of the whole discussion. Situations like this hurt me the most…how quickly we forget who we are and how we got here. We need to start showing our parents the respect, appreciation and time that they deserve, they will not be here forever…the inevitable is just around the corner. Not taking this opportunity to connect, will leave us with nothing but regret and empty desires for what should have been.